So it’s time to finish up the West Gallery space. I’ll show you some views of the space and thoughts about the design and colors. 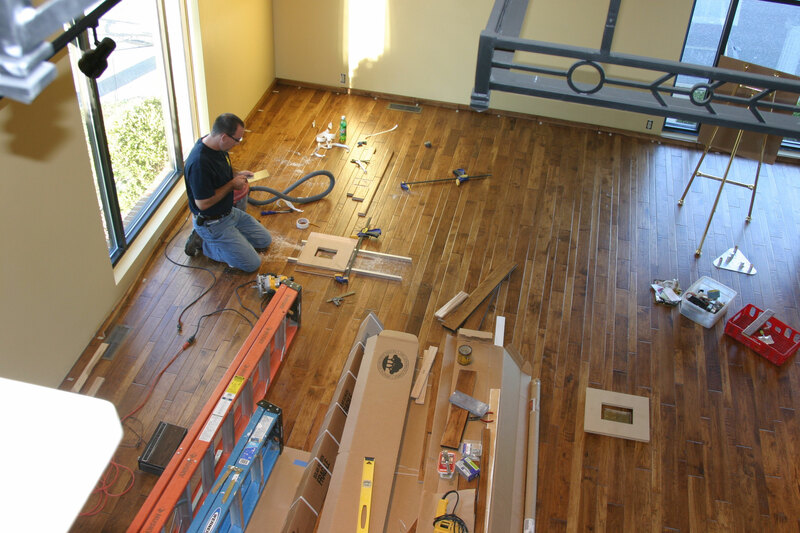 I’ll show you some of the fixtures I made that makes the space as flexible as possible. First thing we have to do is take down the temporary wall! Plastic and cardboard kept the place halfway clean. 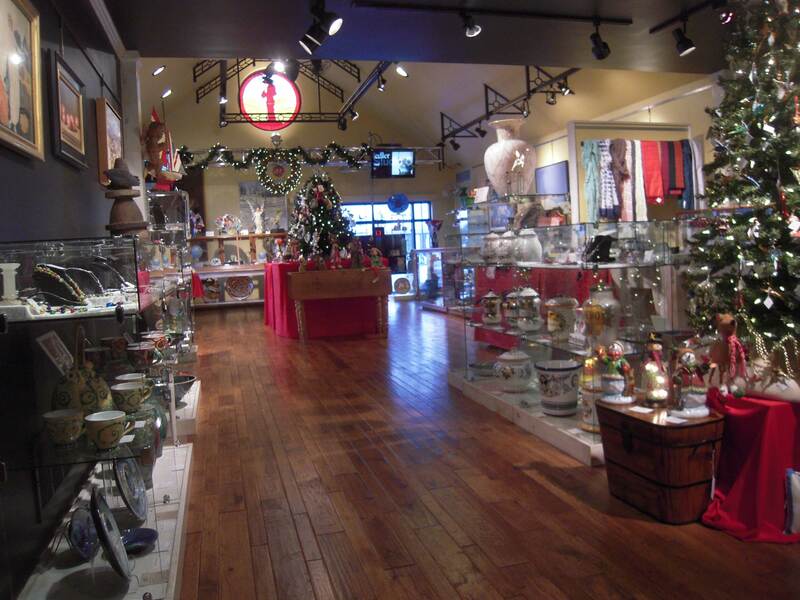 All our displays are mainly glass – so dust was a major problem during renovation. I installed several floor outlets. I didn’t want to use standard floor plates because they protrude up above floor level. I had brass plates fabricated by this guy. Craig Jackson – a great guy and a skilled machinist and wood turner. Right after this project he founded Easy Wood Tools a very large successful company. 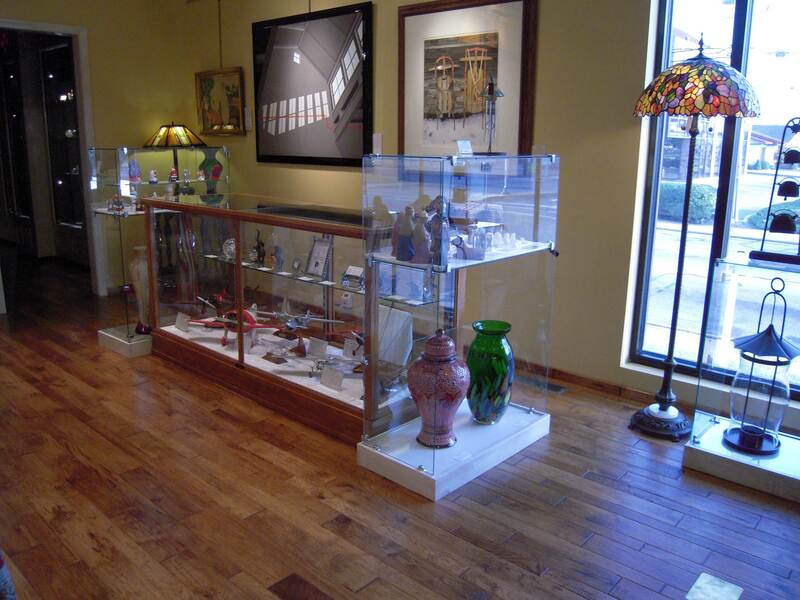 In the front yellow gallery area I used the narrow size flooring for the baseboard. I cut the tongue off the side and bevel cut the top and stained the cut ends to match. 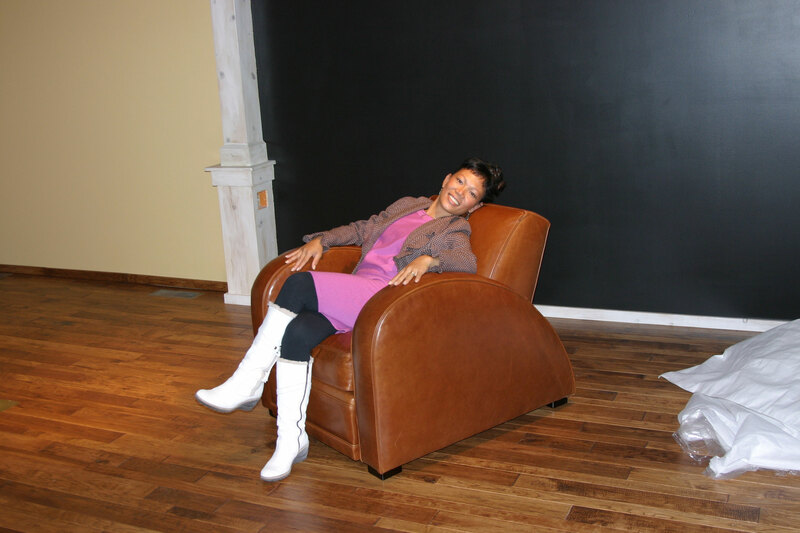 Here’s Francia relaxing in a Room & Board Roadster Chair. They no longer sell these, but we have two in the gallery and people (mainly men) love to sit in them while they wait for their partner to finish shopping. 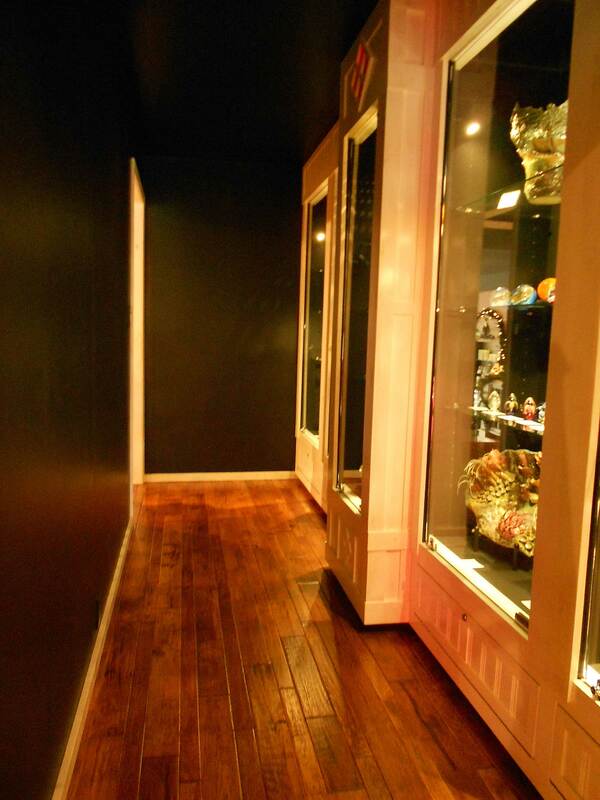 You can see I used white baseboard in the black gallery and the flooring in the yellow. the columns delineate the black and yellow walls. This view shows you the elevation difference in the West Gallery space. 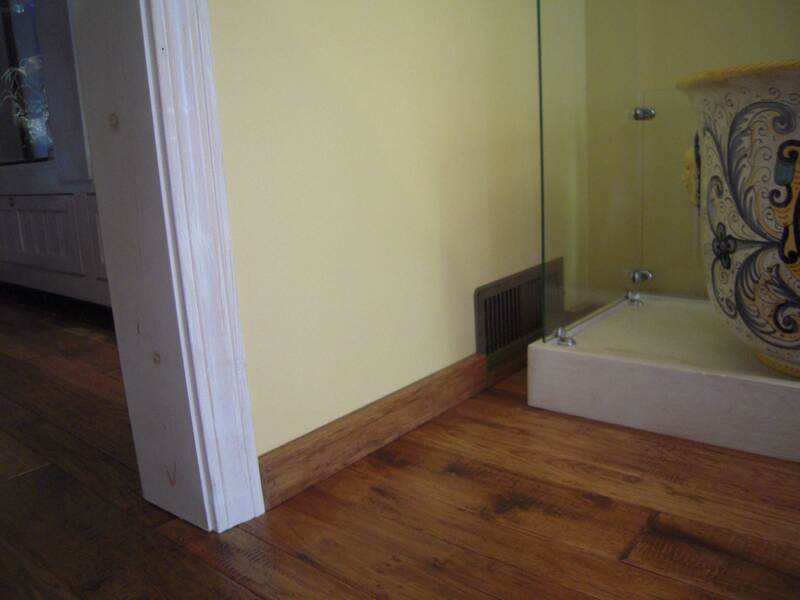 The step risers are also made from the floor material, as well as the treads themselves. This view is looking towards the East Gallery space. this central room has 8′ ceilings.Walls and ceiling are painted with an eggshell black latex enamel. Here you can see the glass gallery opening to the right. All the white fixtures you see I made from #2 pine that was white washed with thinned latex paint and coated with Diamond Clear Varathane water base coatings. The space for the glass gallery that was converted from bathrooms. The area works to give the otherwise open room a little mystery. People love to ‘discover’ this room. 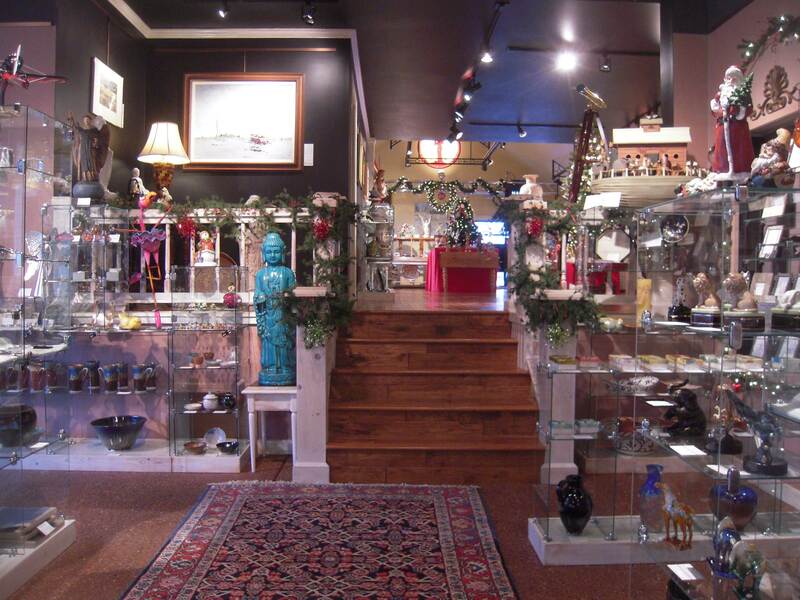 The display cases are usually dark until someone walks into this space. Motion sensor switches activate the lights. 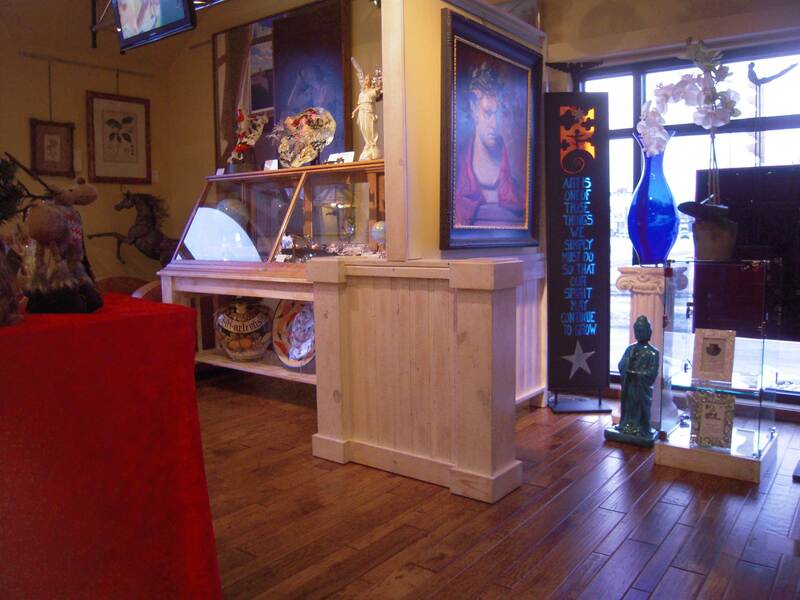 There are several old display cases that my brother refinished for this space. 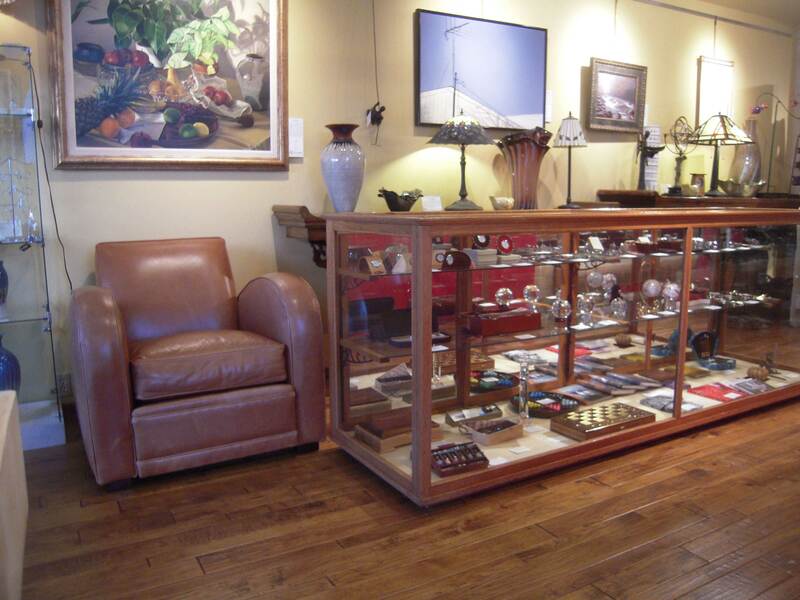 They add some warmth and character to the more modern glass displays. 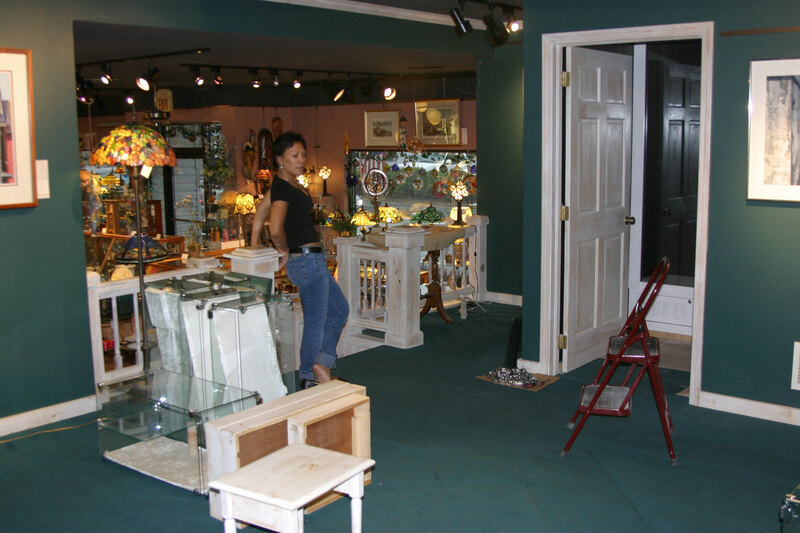 I built all of the glass displays from standard tempered ‘binning’ glass – usually used in clothing store displays. 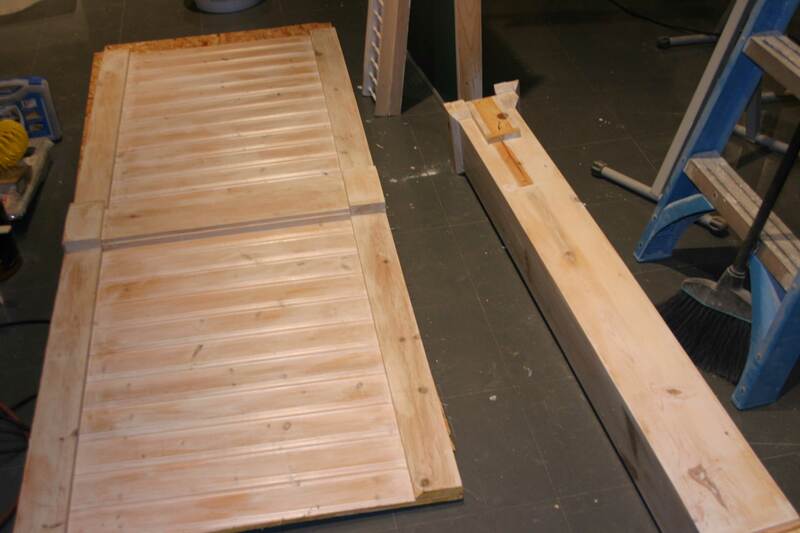 The bases are pine and plywood with the same white washed finish. They are easy to move to change the look of the gallery. 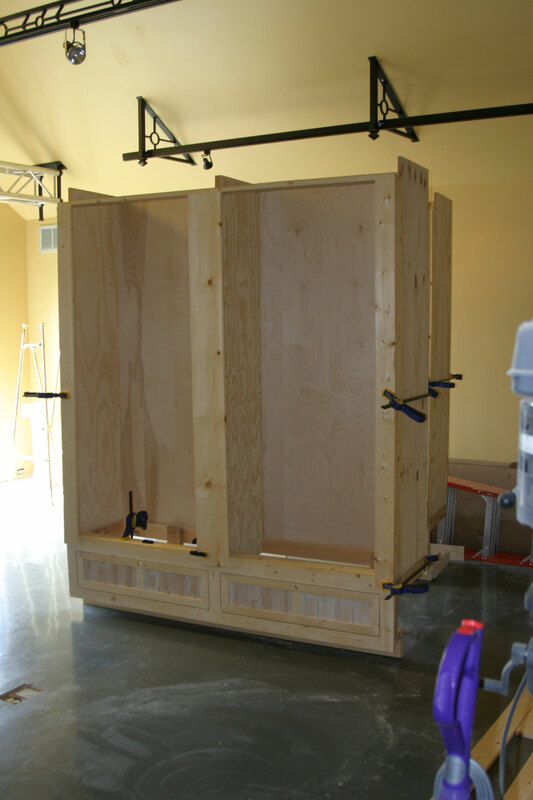 This is another 8 foot case with Roadster chair companion. I used a Walker hanging system to hang all of the art. Easy to reposition and no holes in the walls. 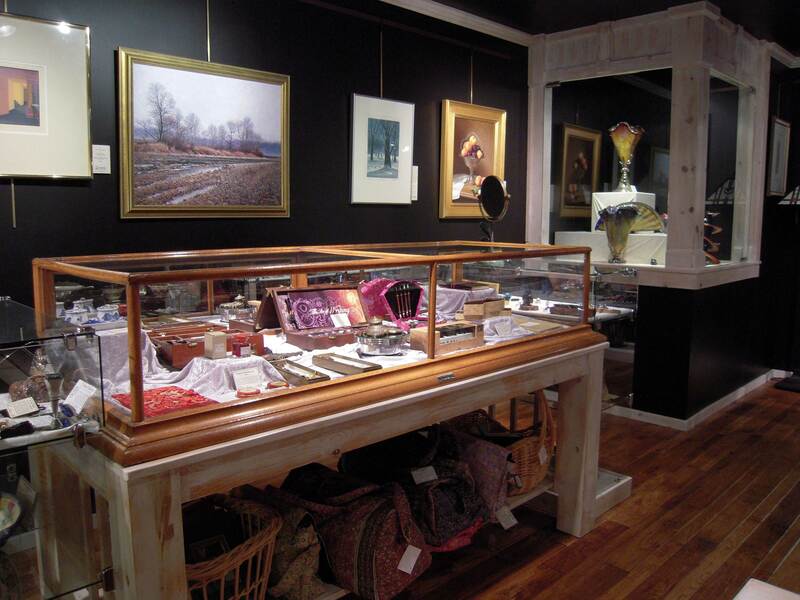 There are also several antique counter cases as well. I built custom tables to fit each of these. Simple square legged tables with pine tops. The glass display behind is where the basement stairs are located. 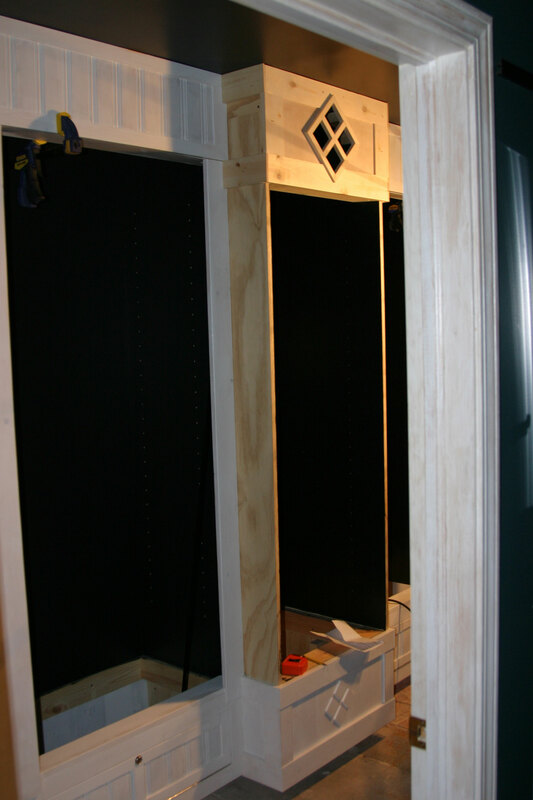 Instead of boxing the whole wall area in, I made the bottom of the case high enough for the stair head room and enclosed the rest with the same 3/8″ glass doors and pivot hinges. Pine trim finishes the case design. I made a dozen of these movable dividers. They are made from thin tongue and groove pine. They have hanging systems on each side for artwork. We move these things around all of the time. Behind is a restored candy case on it’s wood table. A view looking into the West Gallery – before Christmas. As you walk into this space it draws you through to the front, warmer room. Frank Lloyd Wright used a lower ceiling height that opened into a larger volume space – this area is similar, going from an 8′ ceiling in the black gallery space into the yellow gallery with a ceiling height of 15′. And a photo taken today. It’s easy to move everything to a different spot – or take it out all together. It’s fun when we have a new visitor in the gallery. Some don’t know what to think of this place – hopefully they enjoy being here as much as I have enjoyed building it. I’ll post some more on the concrete floored East Gallery and the stained glass ceiling in my office in some future posts. 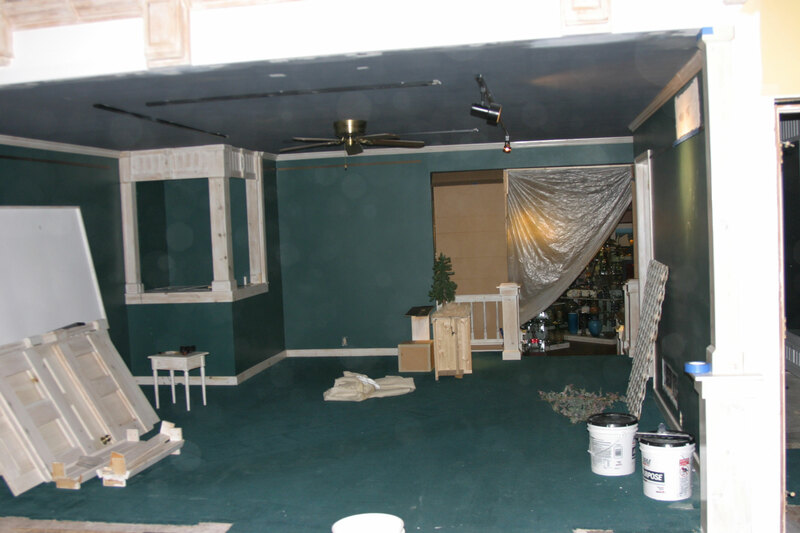 Maybe by then I’ll be back to renovating the house this blog was created to celebrate. But first I have to get a new knee next week. I’m finally getting around to putting some new floors in this place. But it wasn’t easy. Lot’s of issues with trying to straighten out an old farmhouse floor with a hump in the middle and numerous patch jobs – but it’ll be worth it. Here’s Francia taking a rest from clearing the middle ‘green room’ gallery. To the right is the glass gallery entrance. The doors and casings will be removed momentarily. 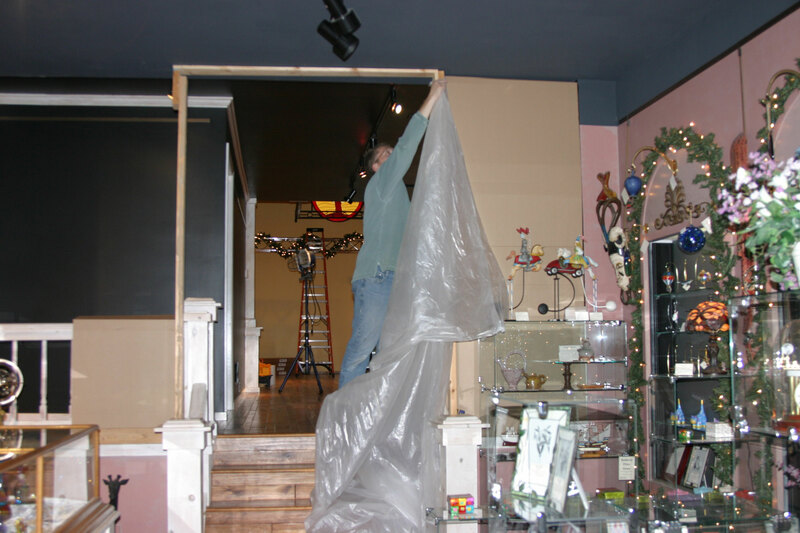 The area cleared and a temporary wall of cardboard and plastic going up – we have to keep the business open to pay for the new floor and have a way to get in and out of the space easily. 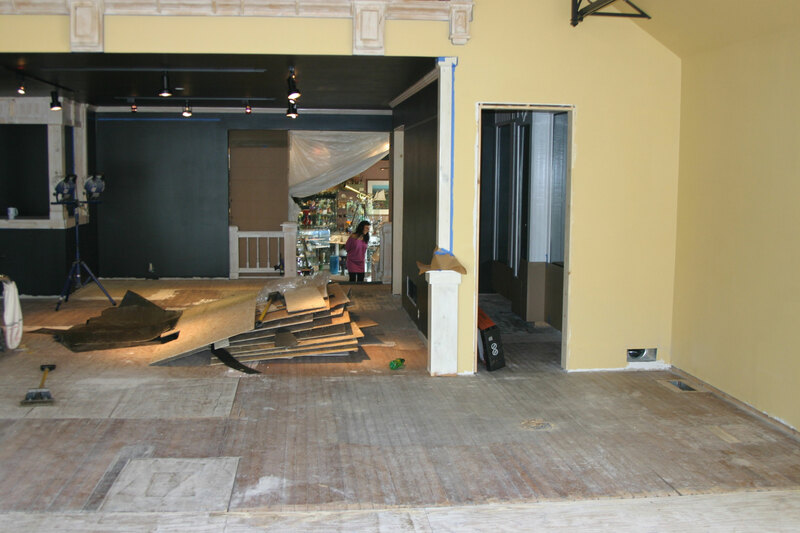 The front area being cleared to start getting the tile and sub floor up. 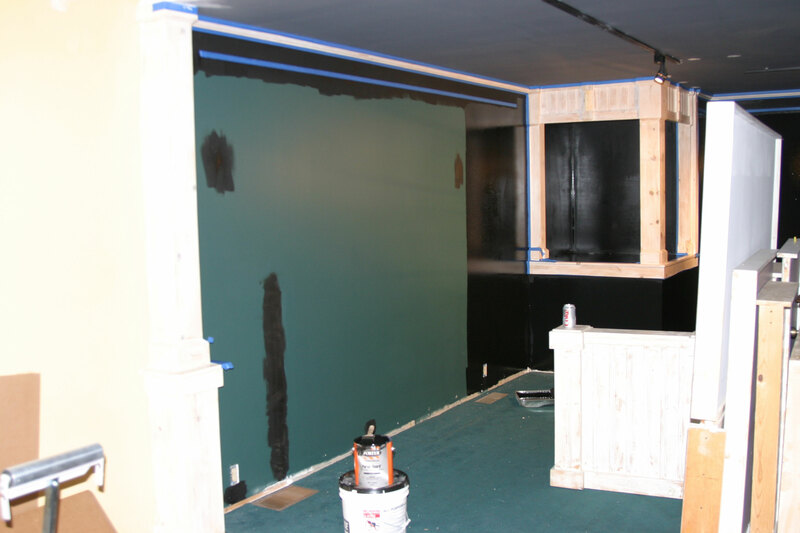 While the old carpet is down – I’ll paint the walls and ceiling in this middle room – black. 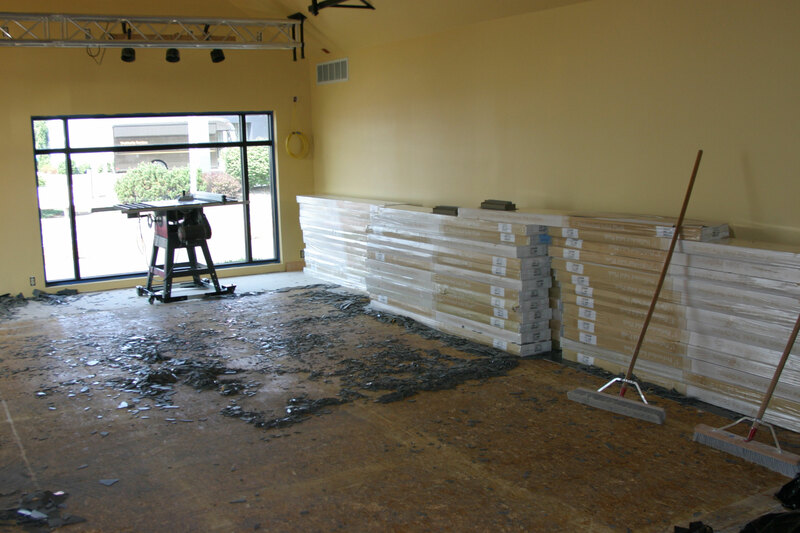 First we get the vinyl floor tiles up. 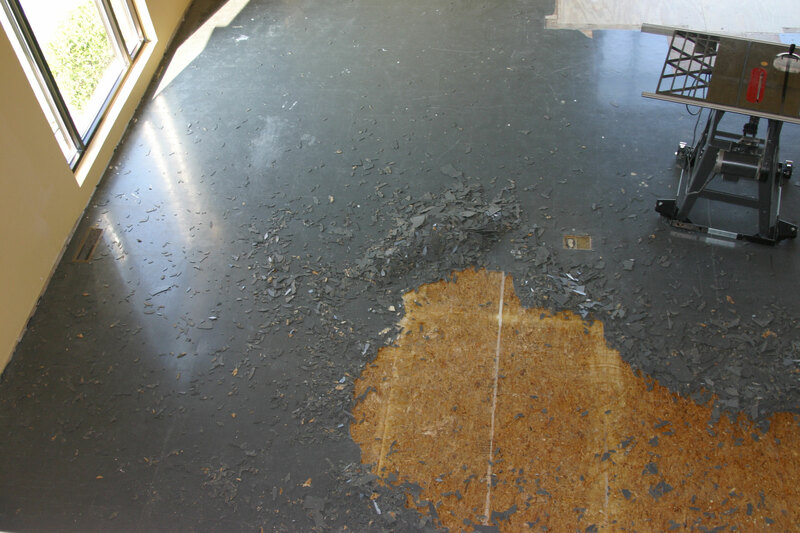 Once that’s up it’s time to get the 1/4″ underlayment torn out. That’s a stack of floor #3 by the wall. See explanation below. 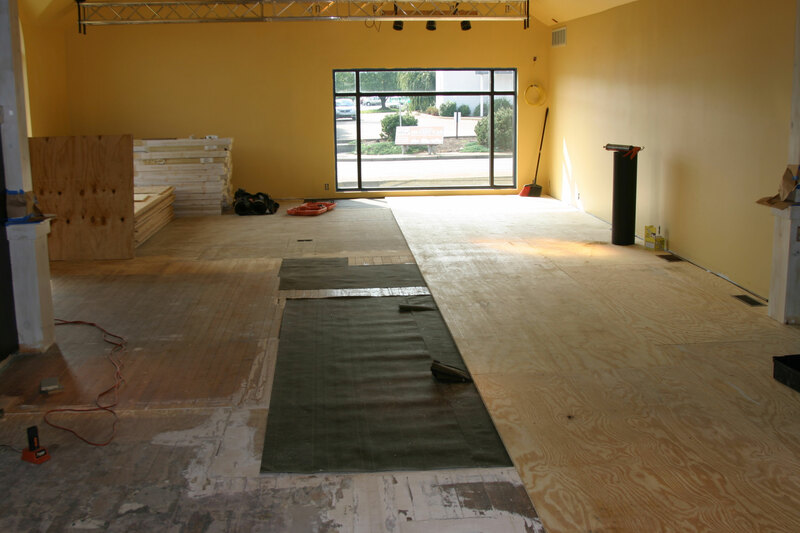 The sheets of underlayment were removed to show the patchwork floor of the original house. The square in the lower left was the space for the chimney. I used 3/4″ plywood to cover the whole floor. There was a hump that bisected the room that had to be ground down with a floor sander because it would show when viewing from the other gallery space that is three feet lower. Layers of felt paper are used to shim slight dips to create a flat floor. 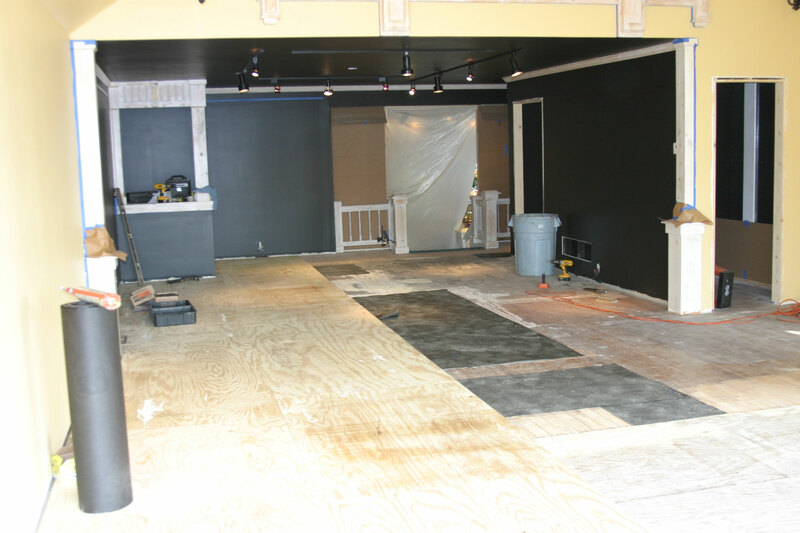 Looking back in the now painted black room.The doors on the glass gallery room have been removed and new smooth casings are being fabricated to trim out the door openings. Now to the floor – ah if it were only that easy. You see, this is floor number three. The first one came in and it was an oak floor – with a finish that looked like a 1980’s kitchen. Kinda brown with some salmon thrown in. Ugly and nothing like the sample. “Take it back” I said. #2 arrived as another oak floor. Supposedly hand scraped but looked like a machine made little grooves that looked like crap to me – and again, nothing like the sample. “Take it back” I said. 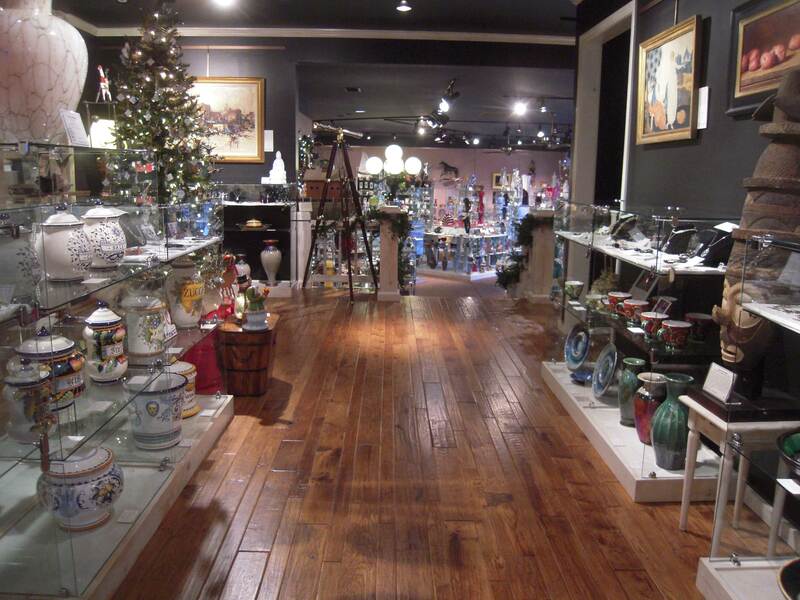 So finally I found this 3/4″ hand scraped hickory floor – “great! I’ll take it”. Only one problem they said “It usually comes in three widths – 2/12″ 31/2″ and 5″ – we don’t have the middle one”. “great! I’ll take it”. So that’s why there’s only 2 widths and I like it this way. It looks a little more contemporary to me. The linear element is even more pronounced as the sight line of the floor is 40′ long. The floor is hickory, so it’s hard as heck. 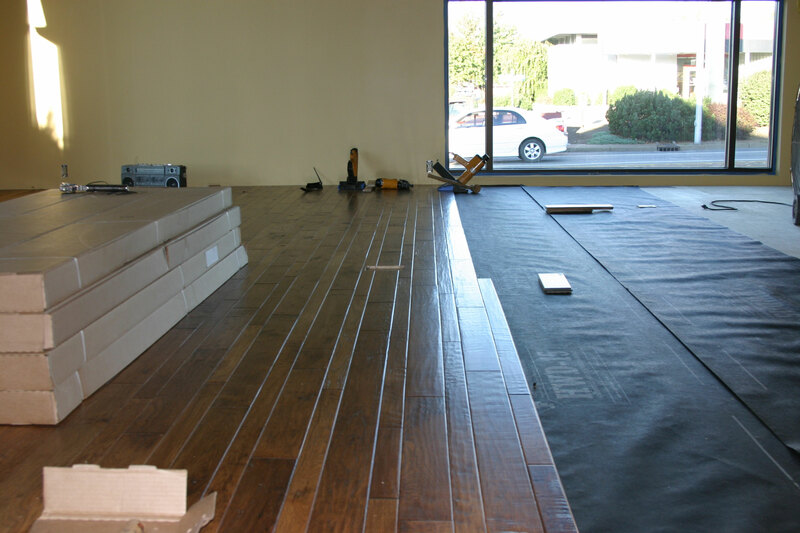 The hand scraped finish was important because it will hide dings and dents that are sure to happen in a commercial space. The medium variegated color will work well with the fixtures and furnishings that will go in the space. The tone is not too dark or light and will not show dust or dirt as easily as other more uniform colors. We’ll finish it up next time and get some stuff to sell in here. 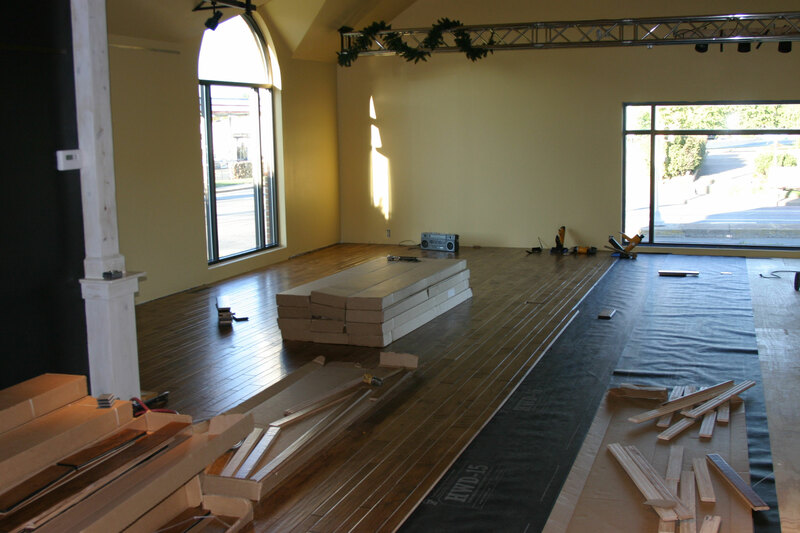 I was originally intending to post about the floors, but wanted to detail some of the steps needed before the floor installation.This area was the original footprint of the 1920 farmhouse – the overall area of the elevated West gallery is 24′ wide by 40′ long. 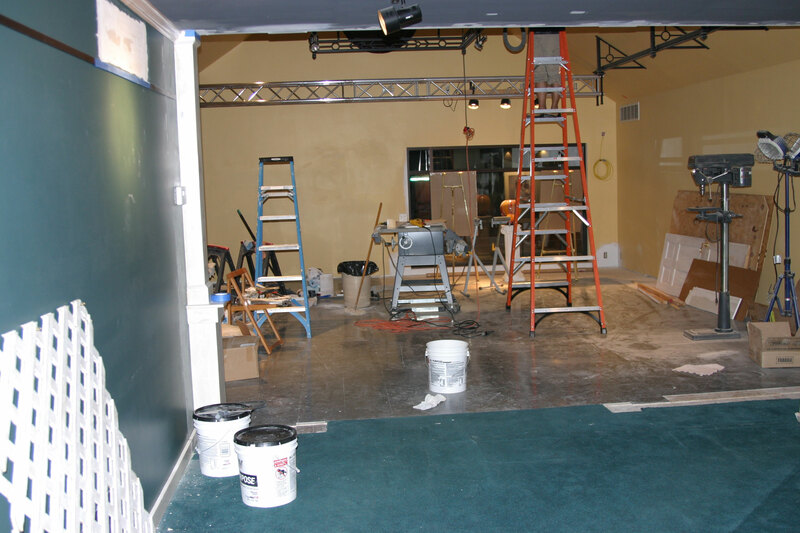 When I originally rebuilt this space in 1989 it needed to be divided for the studio space and dressing rooms. 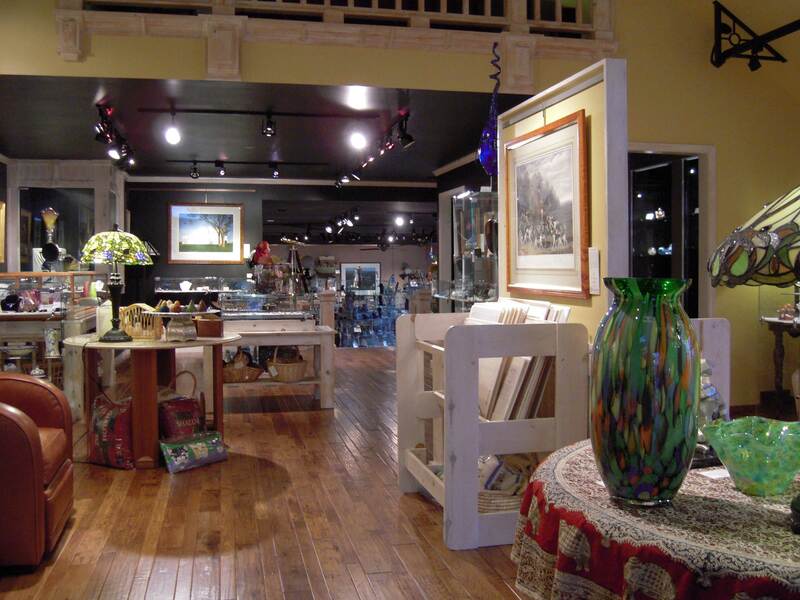 Before I get to the floors I need to open up the area to make it one continuous space for more flexibility for retail gallery space. This area has two display windows. This side arched window was originally installed with a residential window unit. It was beautiful, but vandals broke one of the panes and the only way to repair it was to remove a great deal of interior trim. I decided to replace it with a commercial insulated unit – the panes are replaced from the outside. Here I’ve prepped for the new window that will be finished with drywall returns. 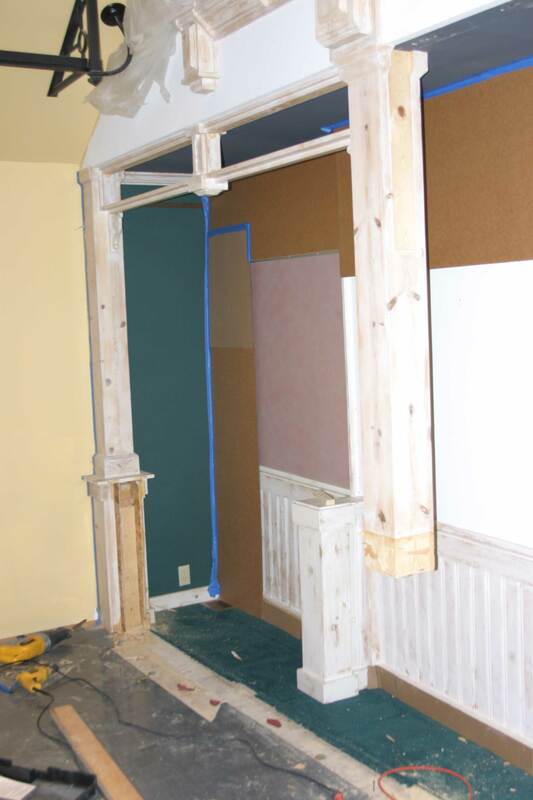 I saved the original interior window trim piece and used it as a mold for the new drywall return piece. 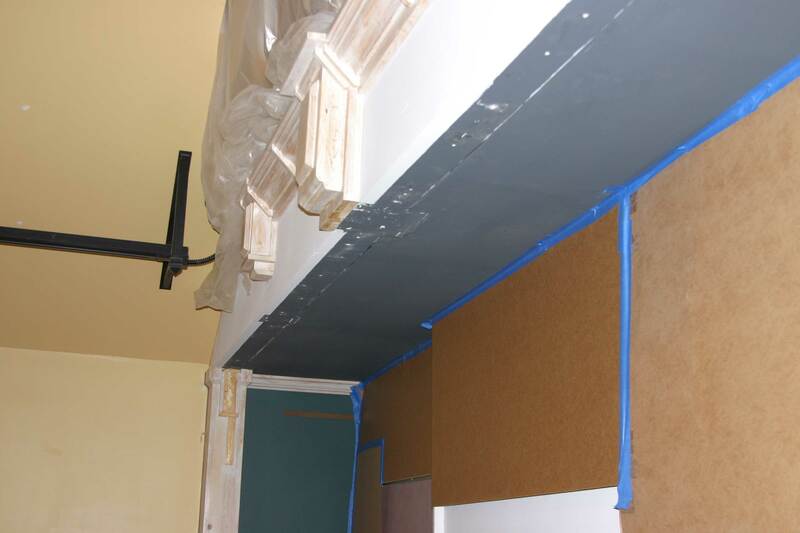 All commercial drywall has to be 5/8″ Type X to meet commercial code in our area. 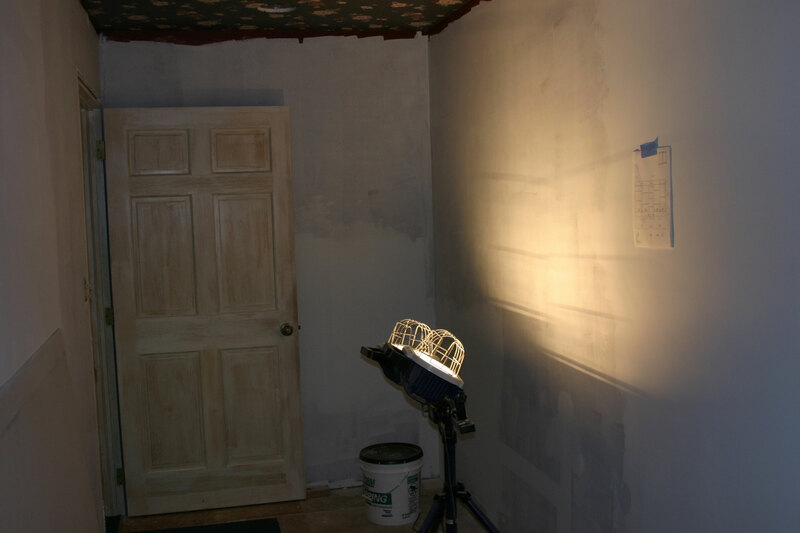 You just moisten a regular drywall piece and slowly mold it to the form. 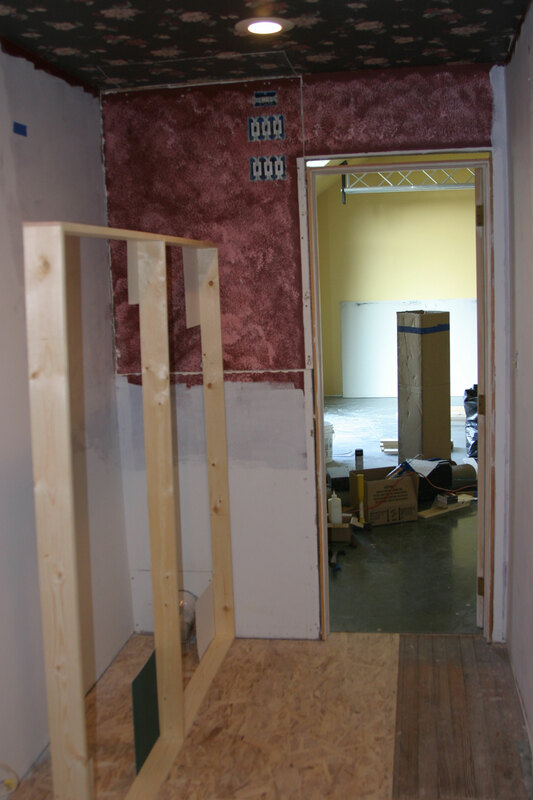 The finished drywall returns and the new arch window installed – simple and clean. 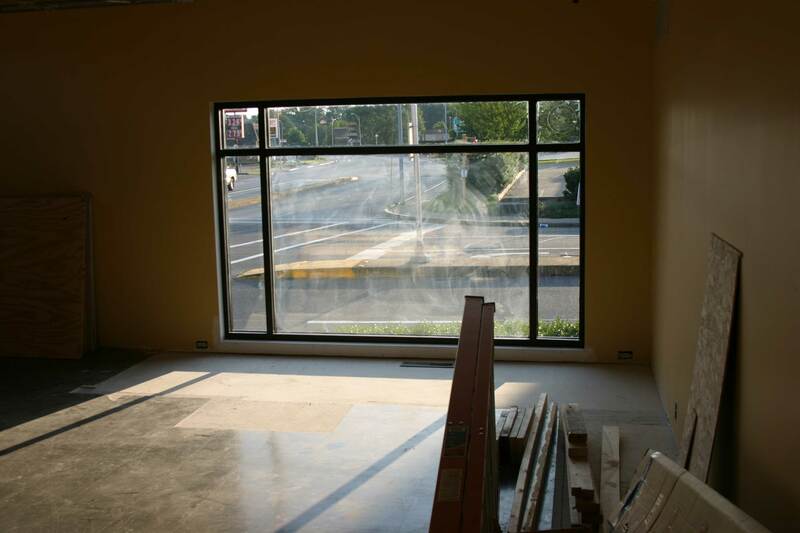 The front window was also replaced and finished with drywall returns. The original window was a single double insulated tempered glass window that was 6X9 feet. It was so large that it was hard to get replacement windows over the years. This new design is much more user friendly and much less expensive to replace one smaller pane. Because this window is so low, it’s lower elements are tempered glass. The original room was divided where the loft office ended. It was designed to complement the Victorian gingerbread trim that was originally over the door opening. We’ll make it a clean, simple design. 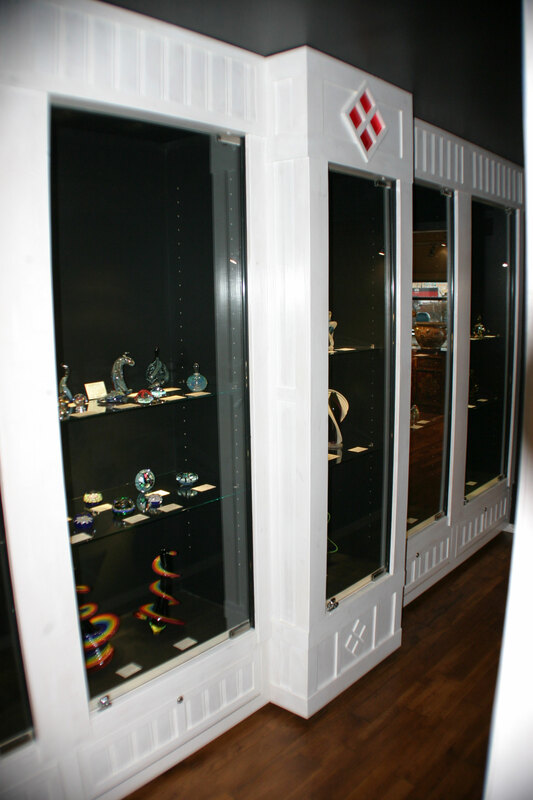 The bathroom door – now turned into an art glass display room is on the right. Demo in progress. I’ll leave the columns next to the wall. They will be repaired and refinished. The columns were made from #2 1X8 pine. 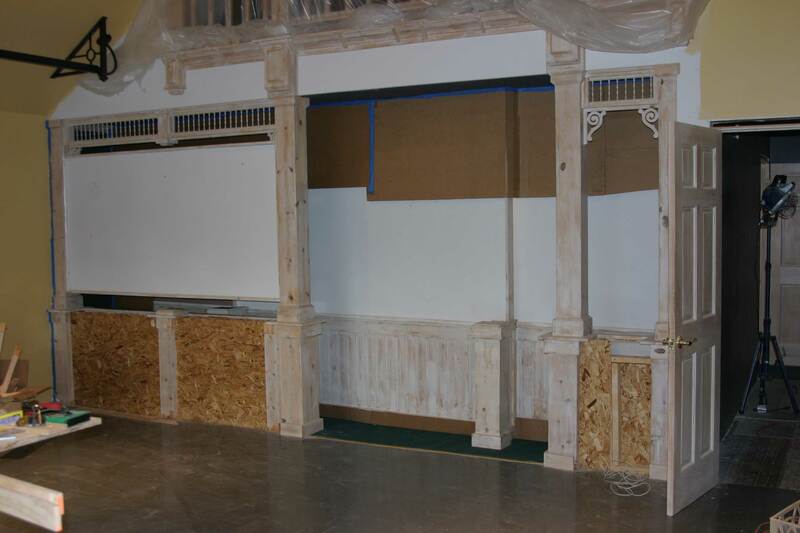 The dividers were clad in thin tongue and groove wainscoting and finished with a latex paint whitewash. The finish still looks like new after 20 years. The left hand divider is removed. 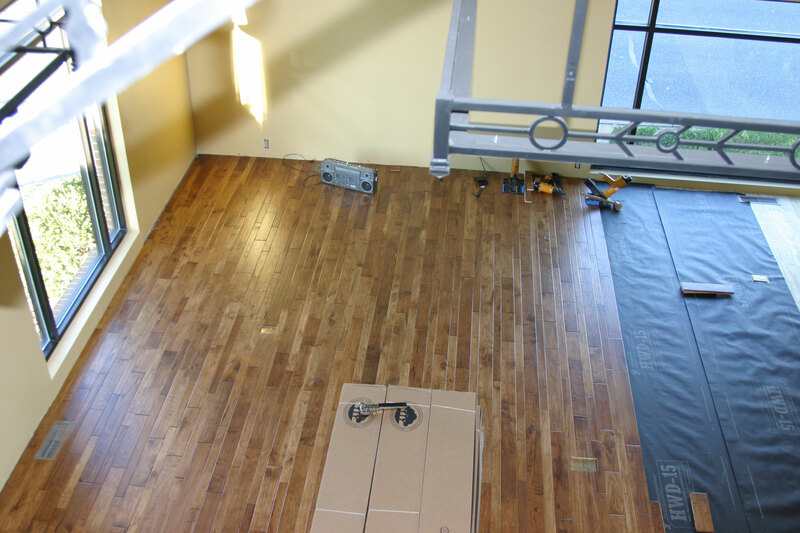 You can see the line where the green carpet in the gallery area and the grey vinyl tile in the studio divided the space. The right hand divider will also be taken out. The ceiling will need some repair before being repainted. 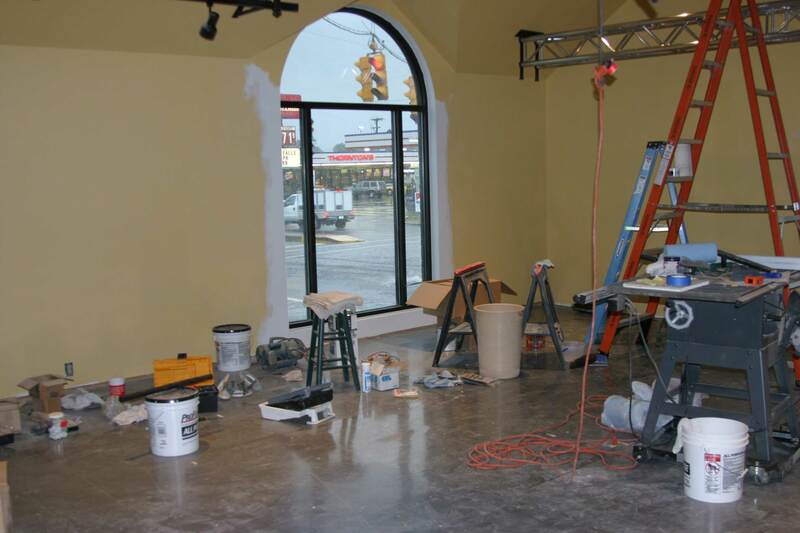 The area is now open with the two columns on the walls repaired and refinished. Now we’ll get to those pesky floors in the next post. Back to the gallery ceiling elements. 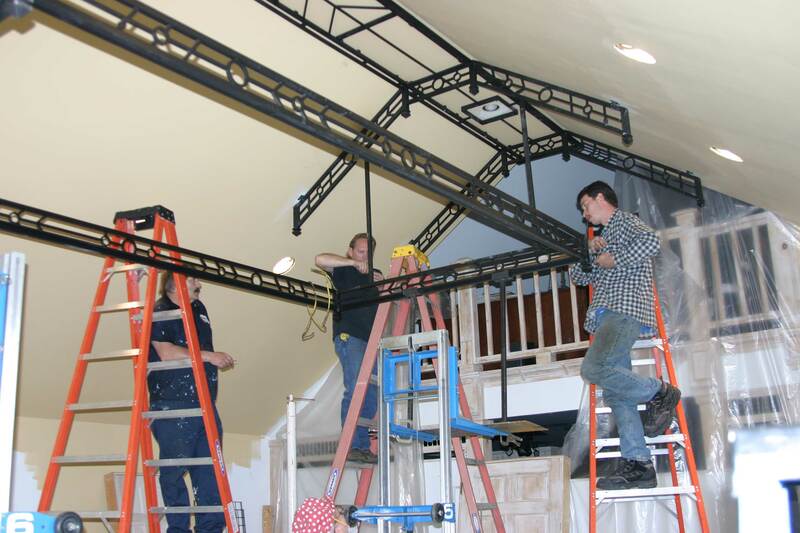 We finished the central iron work and placed the large aluminum stage truss across the width of the room. 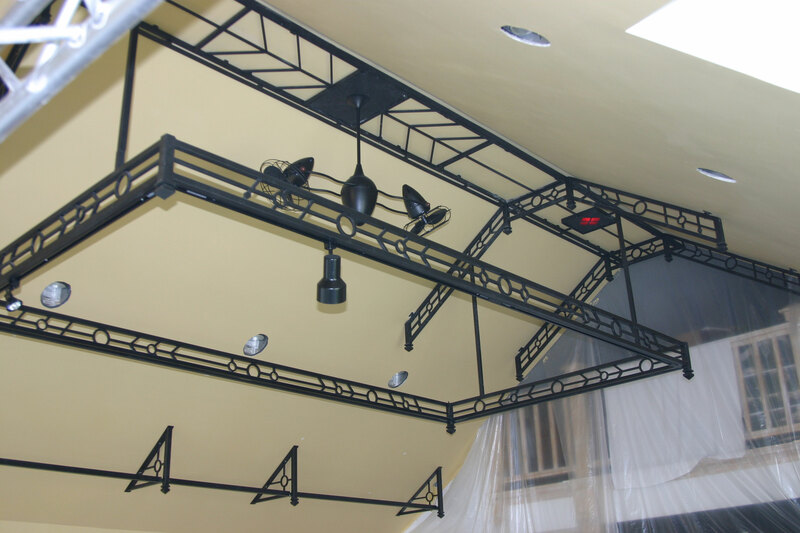 The black iron brackets were mounted to the reinforced ceiling to hold a 1000 pound load. Of course, the aluminum is unpolished and that won’t do in a retail environment. I did get Francia to do some of the cleaning – as this renovation was one dusty project. But polishing the truss? She’s a really smart girl and contributed about 10 minutes on that project. Since I don’t have any images of the truss details when I installed it – I’ll fast forward to today. 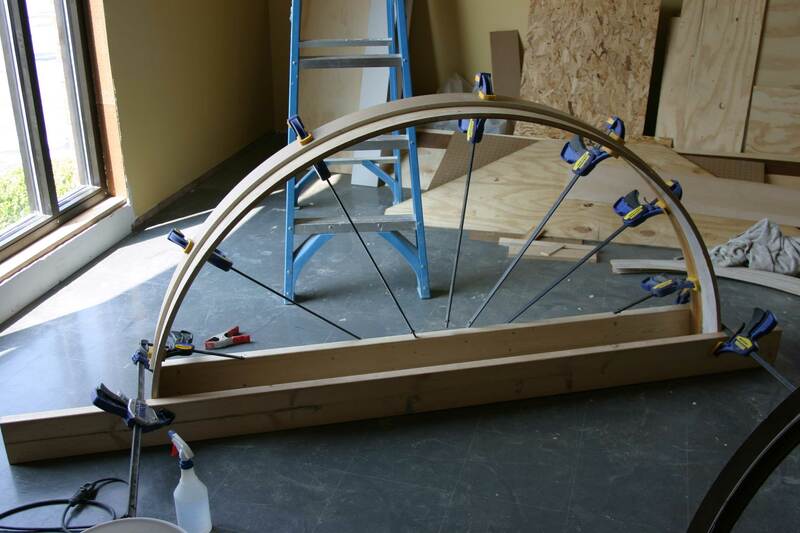 Back when I put up the truss I spent 40+ hours to hand polish the thing to an acceptable appearance. 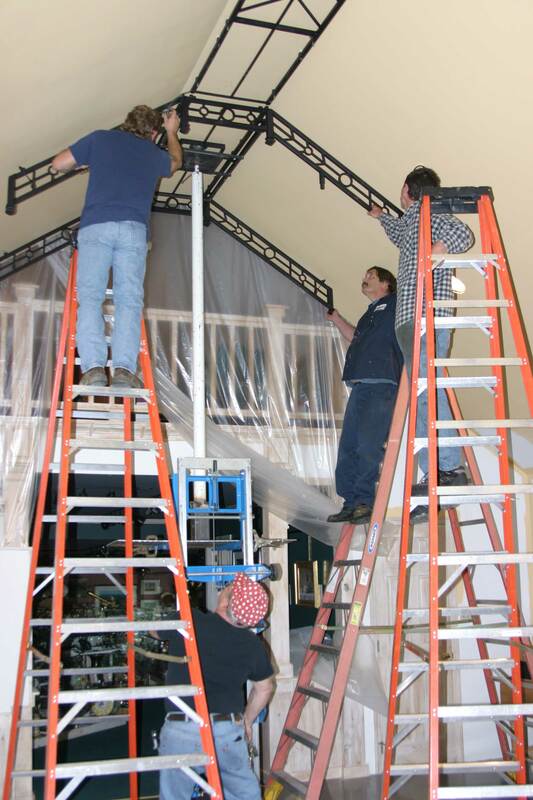 Power to the truss is through one of the 3/4″ flexible armor cables and the other is for the stained glass window lamp that goes to a central lighting timer control. The round window lamp was converted from a theatrical spot. The aluminum housing also had to be hand polished. 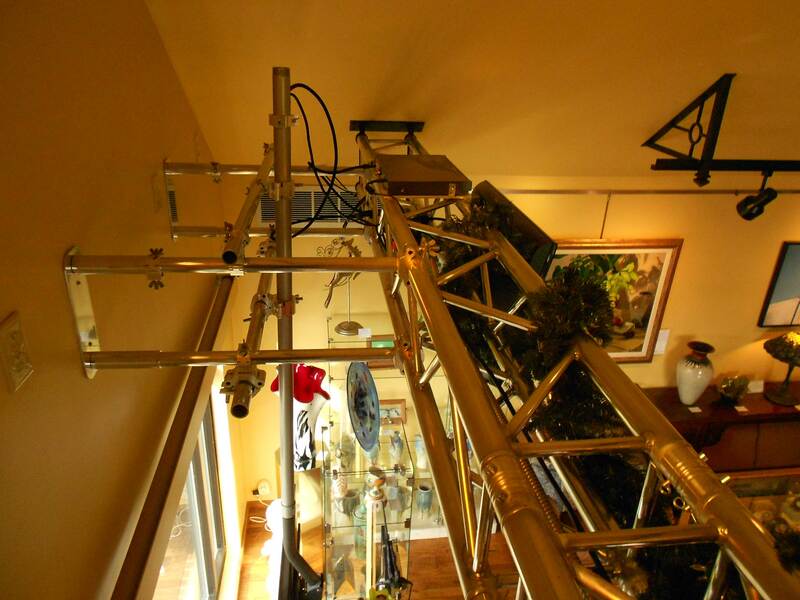 The great thing about the truss system is that you can use it to mount almost anything. The lamp is attached with a truss clamp. Easy to adjust or remove. There are two timed outlet systems. One for the TVs and one for any additional need (Like Christmas lights). All the electrical lines are run through 3/4″ armor cables. 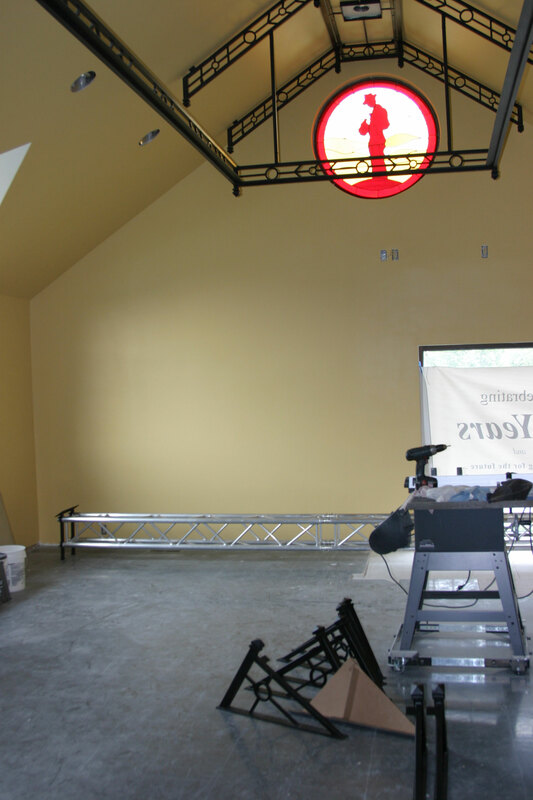 I used the truss to mount a video system that would showcase gallery items on two interior viewed 32″ TVs and one 52″ TV that is viewable through the front window. The brackets for the TV mounts also clamp right on. I built this before super thin and light LED TVs were available. One of the two interior facing TVs. These are Samsung LCDs that have run 12 hours every day for more than four years. The brackets for the DVD player, splitters and accessories are also fabricated from aluminum flat stock. The truss makes a great place for Christmas garland as well. The large TV weights nearly 100 pounds and was mounted by a series of clamps and polished pipes. These are also removable and fully adjustable. The two pipe bracket mounted to the wall are off the shelf items with a couple of custom fabricated sleeves to make everything work. Of course everything had to be hand polished as well. We’ll get the floors in next. 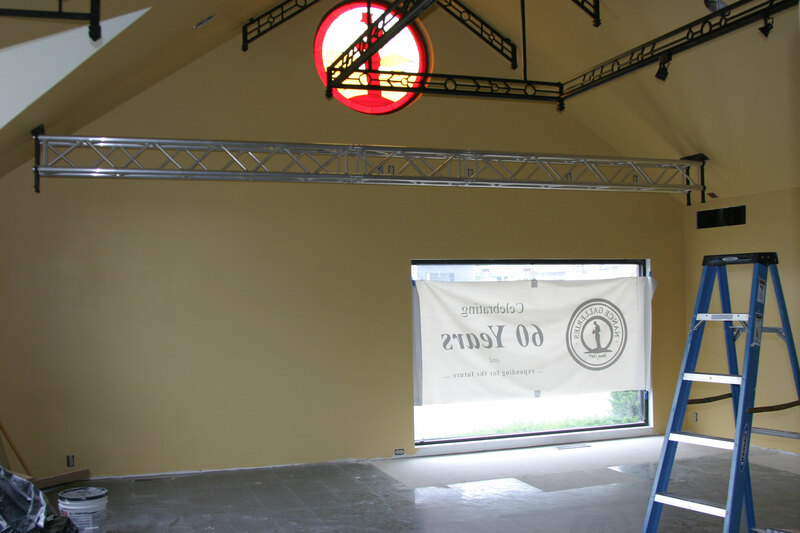 We left off with the large aluminum stage truss installed across the width of the room to be used for a variety of gallery display options. Now we’ll turn our attention back to the now removed bathroom / dressing room area. I decided to use this as a display area for art glass that we feature in the gallery. The space will allow some isolation from the general space and add some interest to the large two room galleries. I routed the switches for the front gallery lights into this display area. I also routed the HVAC floor vent into the outside wall into the main gallery room. You can see that fancy sponge painted walls and wallpapered ceiling in all it’s 1980’s glory. I removed the recessed cans and bathroom vents. 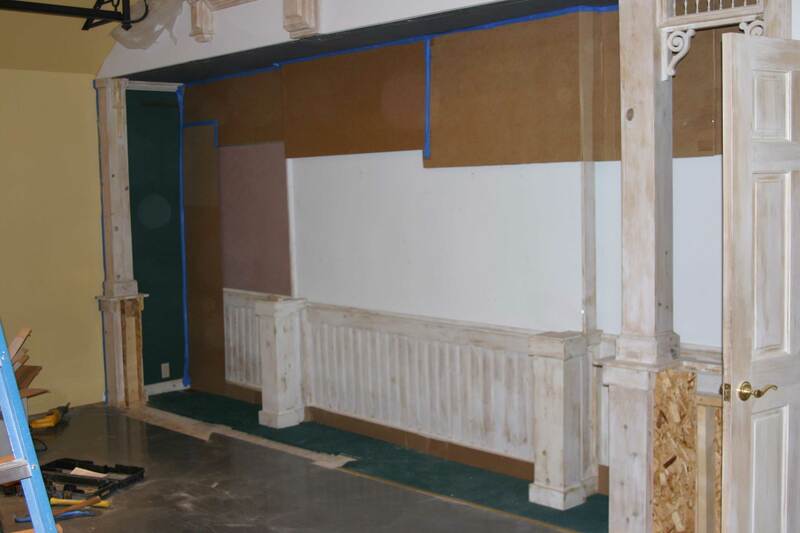 The patches that cover where the center wall was removed are in place. 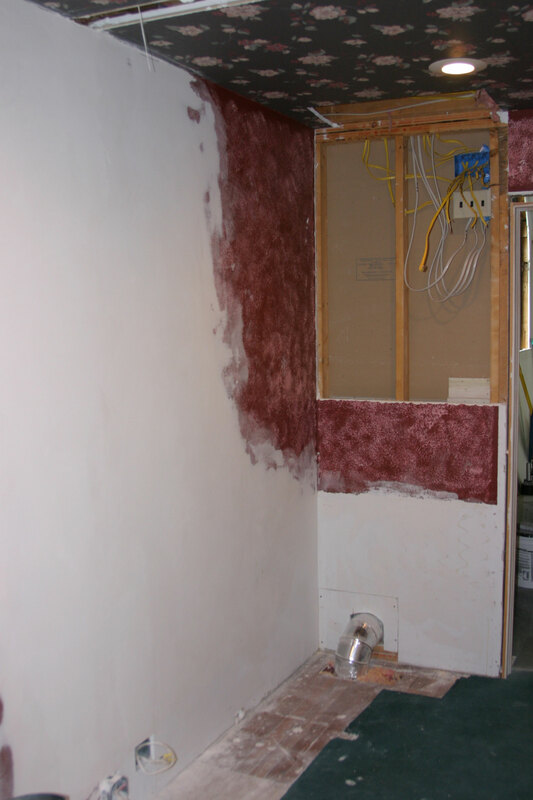 The working plan is taped to the wall that has general dimensions of the room. As usual, this will be a total freestyle project – I’ll never learn. The first display case mock up. I decided to have two display units on each side of a single display unit with a bump out for visual interest…you’ll see. These are the face frames made from #2 pine, as I want the wood grain to show through when I white wash this. The electrical is in place for the low voltage transformers to power the cabinet lights. 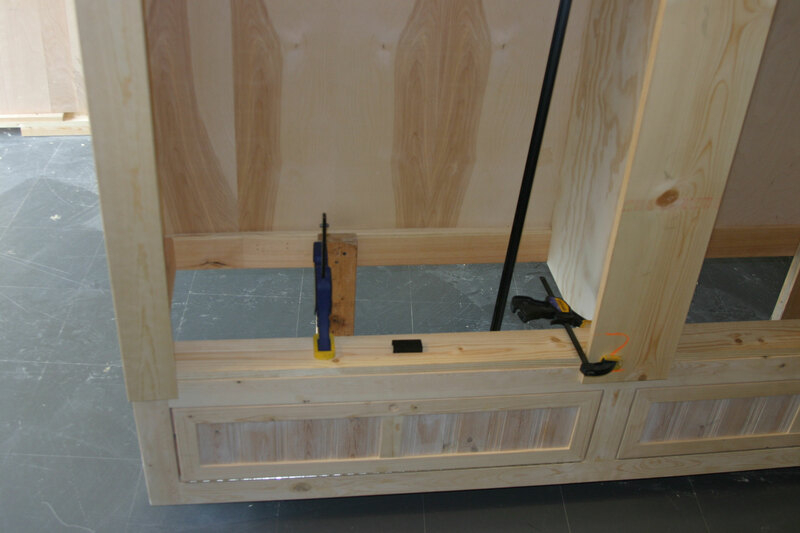 Since I have this nice big room to work in, I built the cabinets on site – handy! These are made from furniture grade 3/4″ plywood. Since these are built in cabinets they don’t have to be complete boxes. The bottom and back are open to allow for the electrical access. 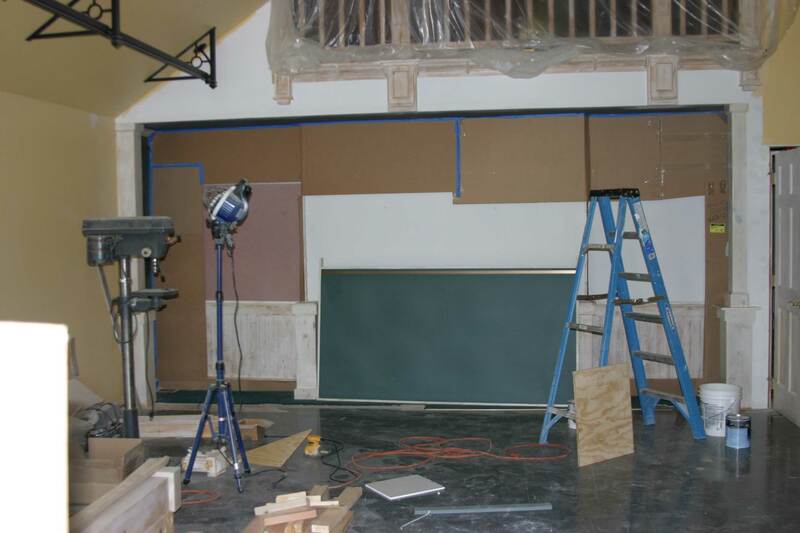 I used pine framed doors inset with bead board on piano hinges for access. 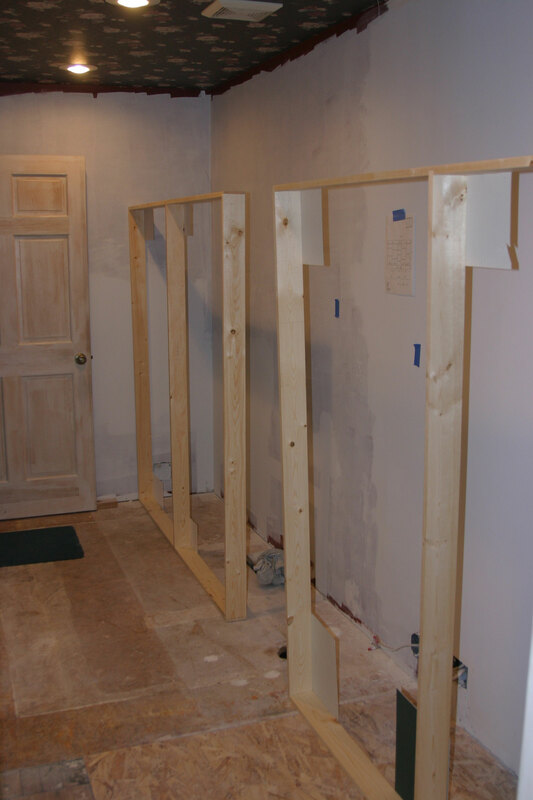 Cabinet backs are 1/2″ furniture grade plywood. The central bump out ties the two large display cases together. 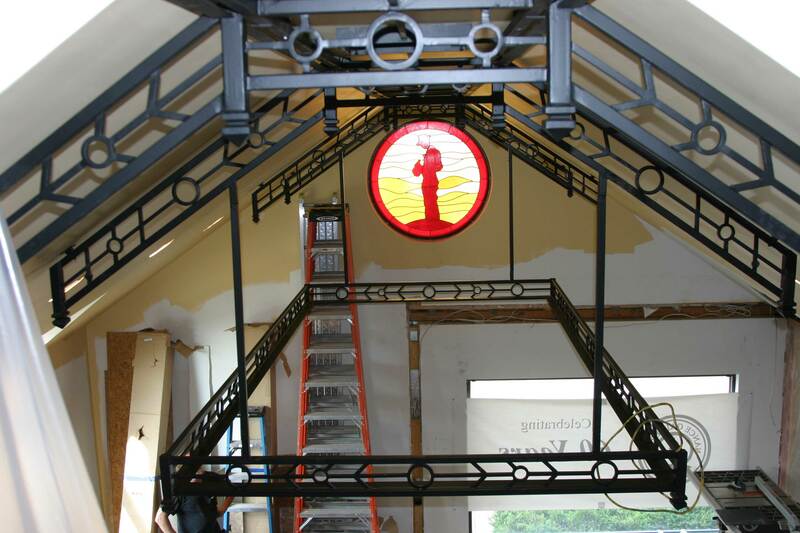 The top detail will hold a red stained glass accent that will match the iron ceiling detail. The bottom wood detail is the opposite of the top.The clamped top panel is also inset with pine bead-board. I made an aluminum jig to drill the shelf pin holes in the side panels before I assembled the cabinets. 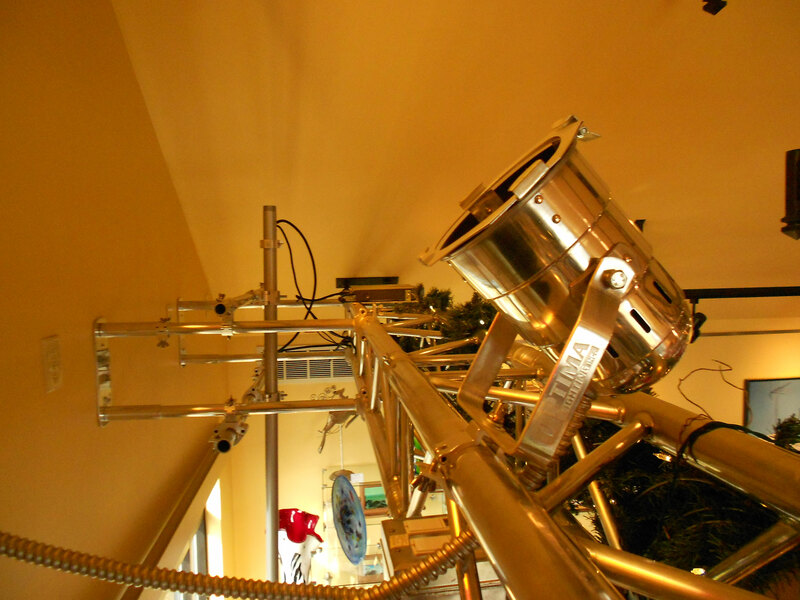 The low voltage halogen track with lamp head is shown. I’ll probably change these out to LED soon. Looking the opposite direction. 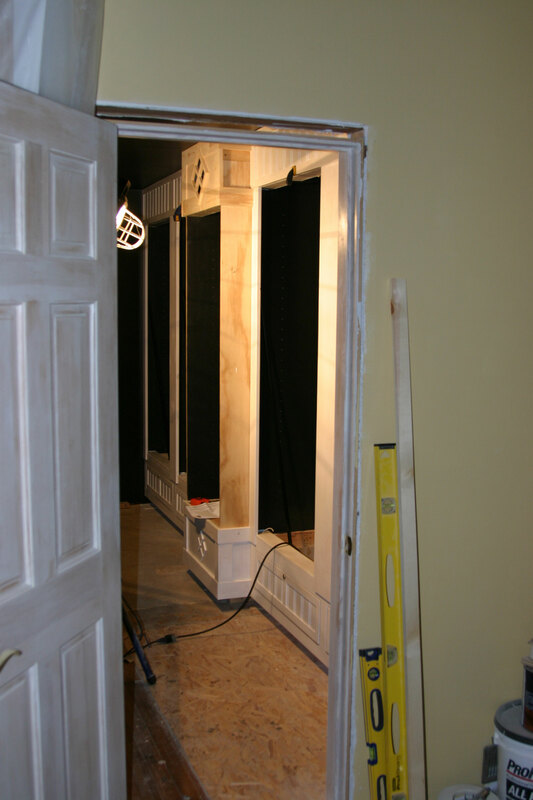 The doors and casing will be removed to put up smooth door opening transitions. It’s hard to get good photos in this space – but here is the finished display area. 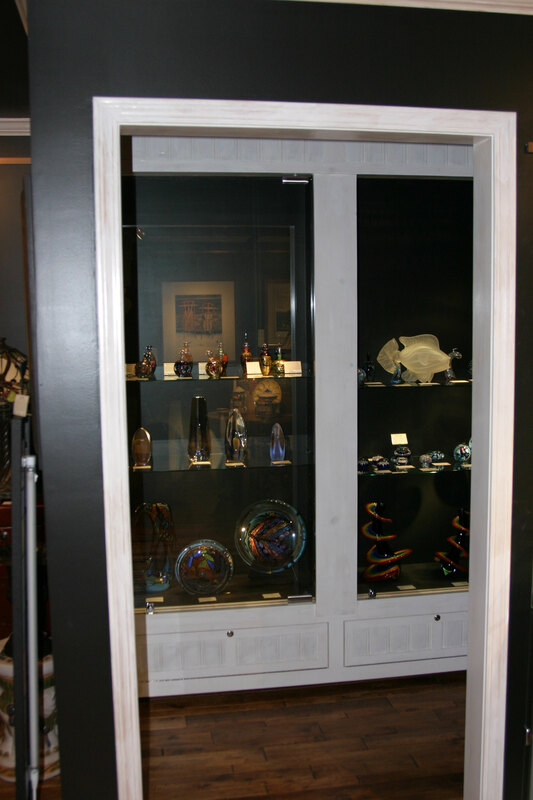 The doors and shelves are 3/8″ tempered glass. The top shelves are not in place. 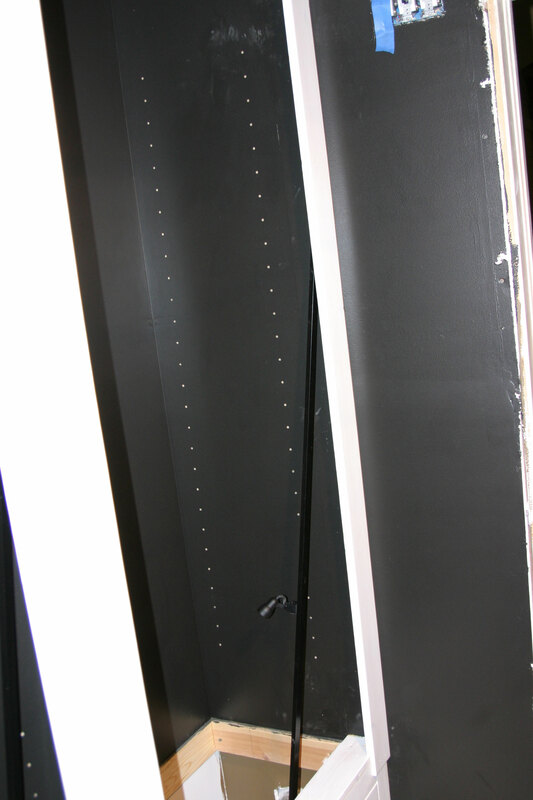 The doors have heavy duty pivot hinges due to the glass weight. 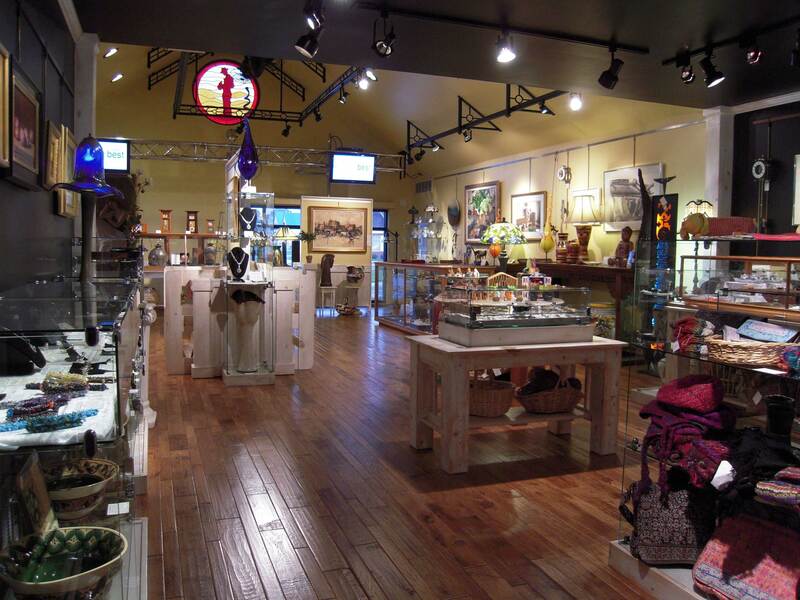 The interior of the display cases and walls are black. Another bad shot with reflections. I’ll do a video tour of the gallery in the future. You can see the bathroom door was removed and new casing installed. There are overhead halogen lighting in the cases as well as MR8 track lighting placed next to the door openings. 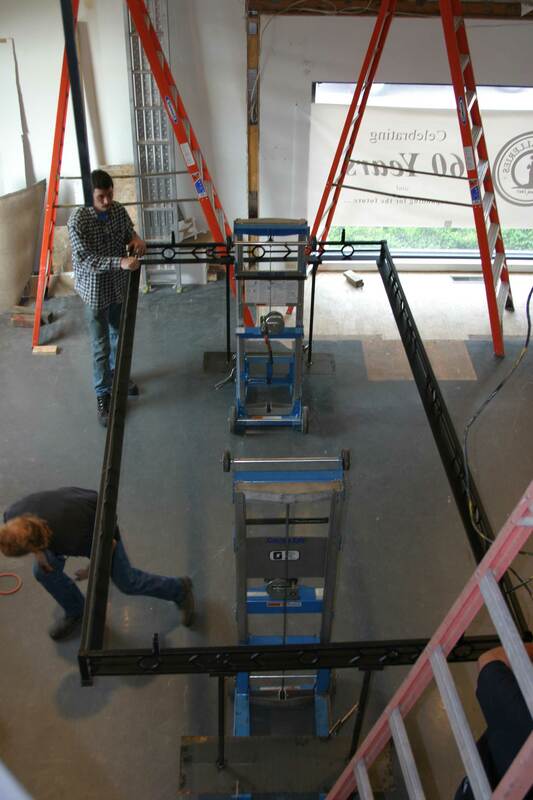 So we have the idea – we have a primary drawing – now all we have to do is find someone to weld the thing up. I called these guys – Chester’s Iron Shop. And yes, there’s a guy named Chester that runs the place. He was up for the challenge. Curiously, if you go to his website he doesn’t list iron ceilings – after this one he said no more – ever. Here’s the start. Since this structure was 24′ long it had to be built in sections.First, the center section was installed and it is spaced off of the ceiling to slightly float below and allow for easily changing the paint color – because I’m still not sure of the color at this point. The two end sections were installed next – that’s Chester in the polka-dot hat. The other section is installed. You can see the coiled wire in the upper right hand side of this picture. All the wiring is concealed within the hollow square tubing, but as with most projects this one had it’s share of problems. 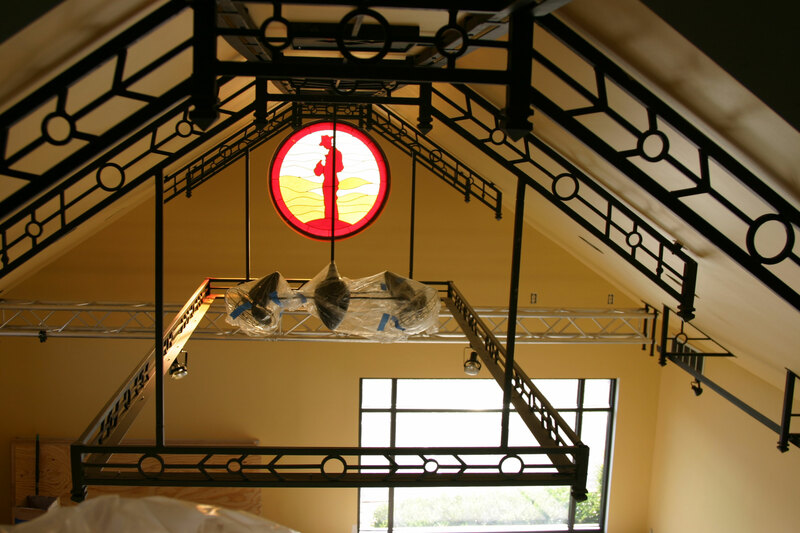 One of the reasons for the ironwork was to hide the irregular ceiling seams. The center section as built was too thin to hide this seam, so the fix was to add an additional plate – you can see the additions on the end arm pieces. Also, after all was done – there was a short in the electrical circuits – so I had to change out all the electrical – a two day job. I realize now that welders make bad electricians. This is what I called the ‘light carriage’ not because it’s light – because it isn’t. I used this to attach track lighting on the bottom perimeter. 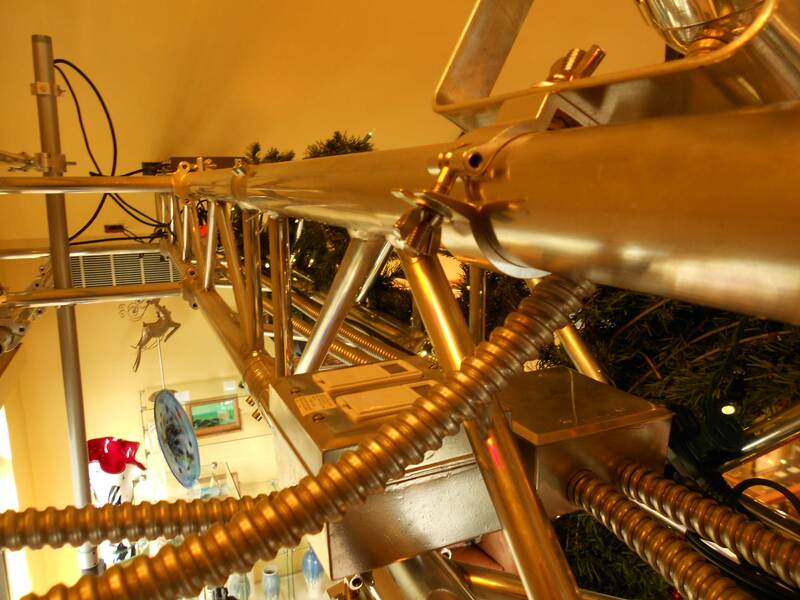 The light carriage is suspended from the central arms by square tubes. The wires to power the lights on the carriage are inside the left hand support tube. The whole system is bolted into the ceiling truss system, so even though this thing is pretty heavy, it’s safely hanging overhead. At this point I decided not to add any color to the circular elements in the design because it was visually busy enough. Yellow and black can you say bumble bee? 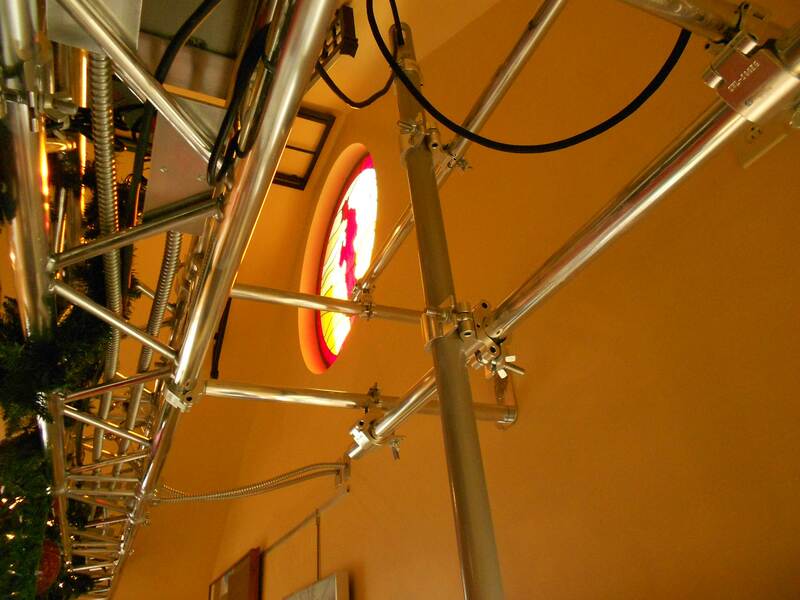 The ceiling and light carriage are installed. In the foreground you can see my little cardboard mockup and the black side ceiling brackets that were fabricated to hold additional track lights. 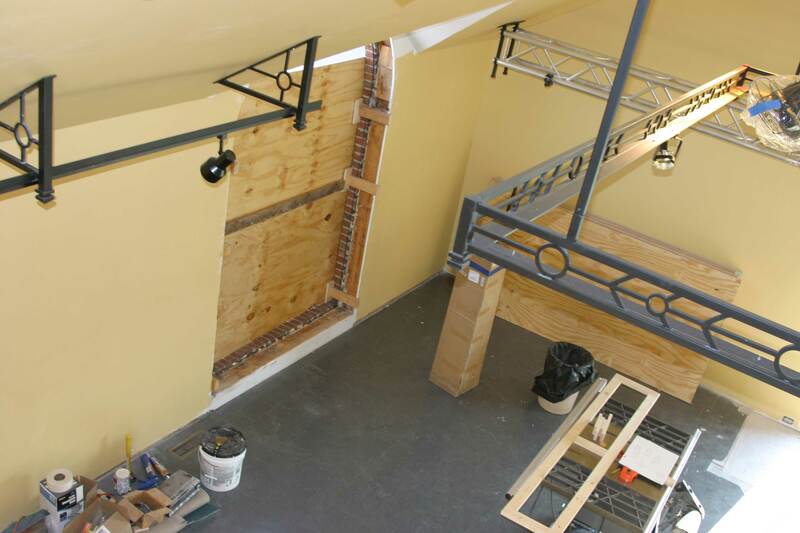 In the background you can see the aluminum truss that will be attached to the ceiling with iron brackets. I have also committed to the color – yellow it will be. 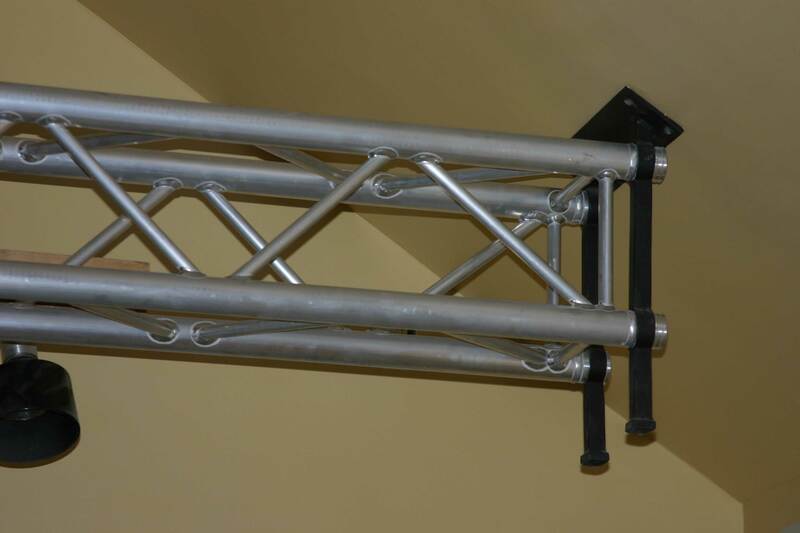 This is a square aluminum stage truss by Global. I attached this with some custom iron brackets the width of the building which is 24 feet. You can see that the carriage has the track lights installed for testing – and everything works! Before the truss could be installed I had to open up the area where the brackets attach to the ceiling and reinforce the structure. 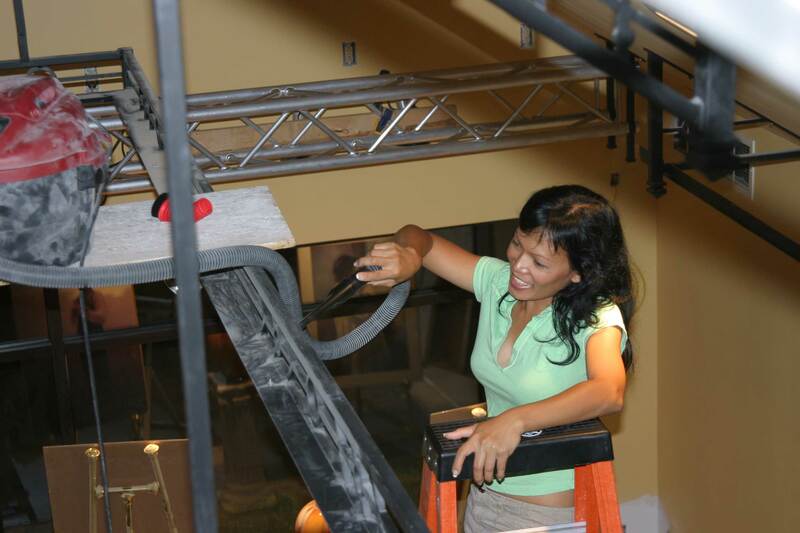 I wanted to be able to hang just about anything from the truss. 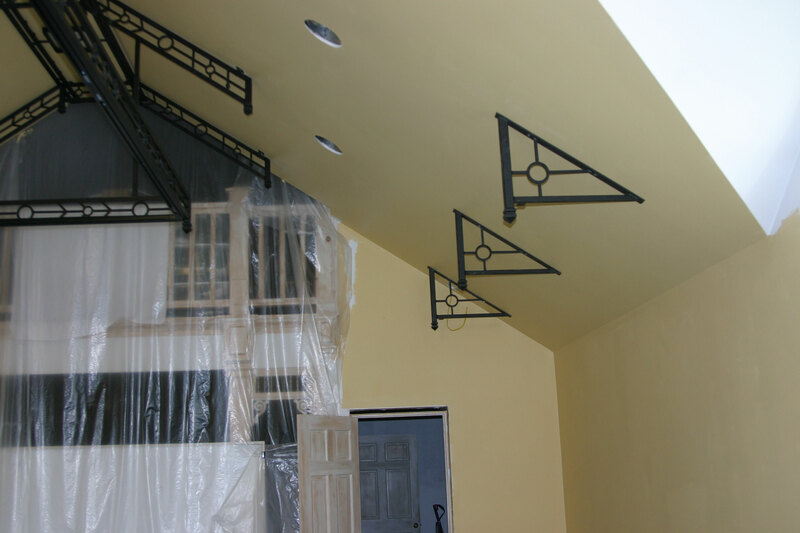 The ceiling brackets were added to each side of the room to be able to attach additional track light fixtures about 4′ from the side walls. This will allow for more uniform light coverage in the room. This view shows the central fan called an Ar ruthiane by Matthews Fan Company. The fan is made in Brazil and is on a motor controller for variable speeds. I was able to make an extension to lower the fan height using regular electrical conduit. 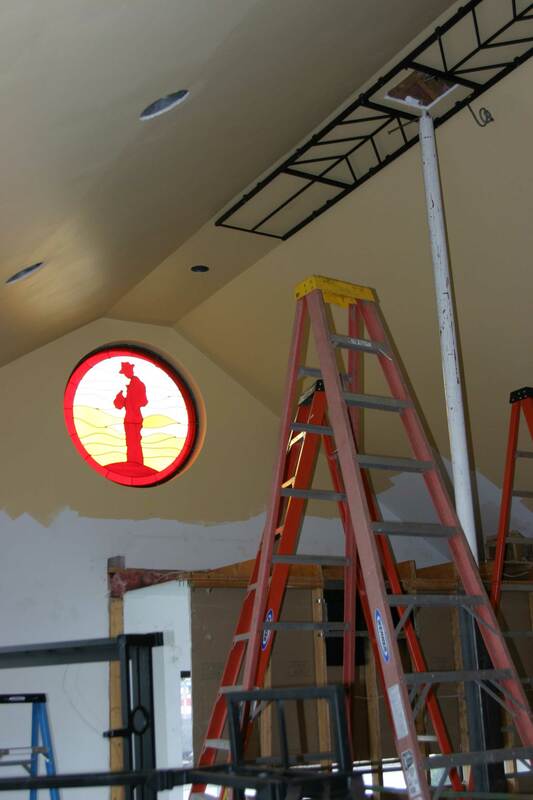 You can see the red element that is stained glass with recessed LED lighting. You can see how the arm pieces are spaced from the ceiling. The yellow wall color is one that matches a color in the 4′ stained glass window of my dad. 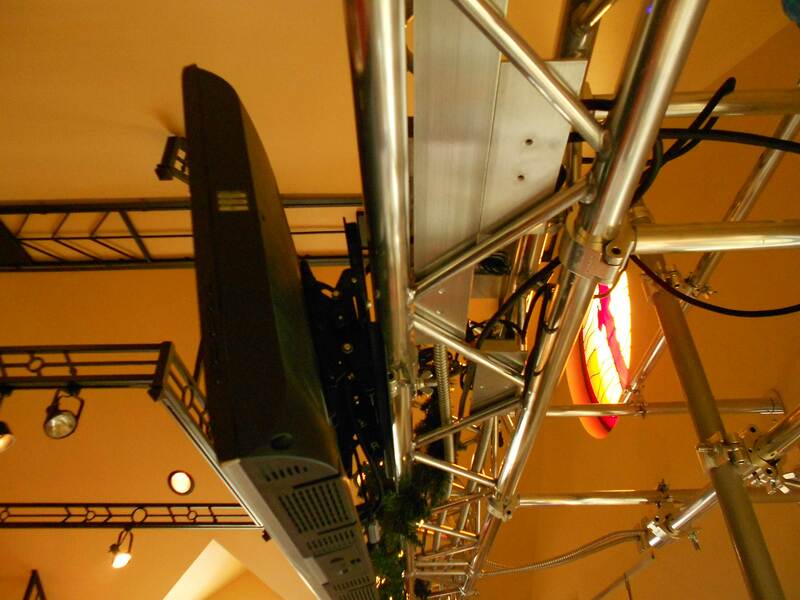 The truss will allow for a variety of attachments that will be useful when making retail displays. Complicated? Oh, there’s more to come – we’re just getting started. Now back to the renovation at hand and tackle the lighting issue in the West gallery. It is a vaulted ceiling that’s nearly 16′ high, so getting retail lighting in this space without having a jumble of track lights plastered to the ceiling was a problem. 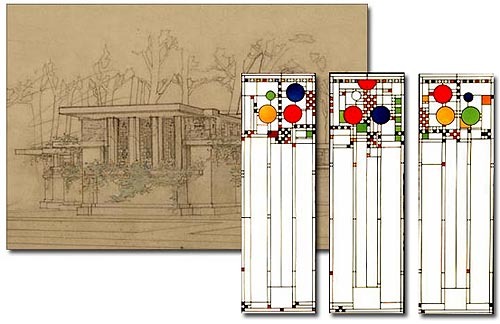 I have always been a fan of Frank Lloyd Wright and find a lot of inspiration in many of his iconic buildings. 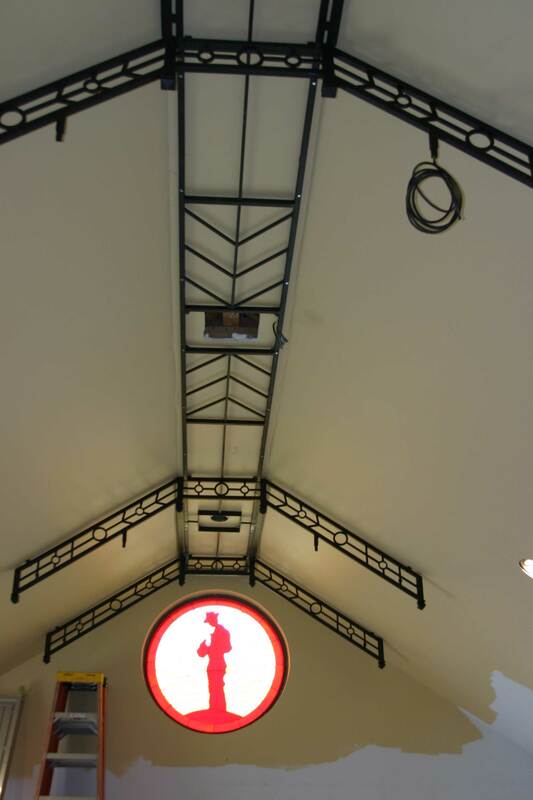 Although I’ll never have the big budget to create something that would do his architectural skills justice, I did use two of his designs to incorporate into the iron ceiling design. First is the Avery Coonley playhouse built in 1912 in Chicago. It was a building constructed for Mrs. Coonley to teach kindergarten. The windows were designed to look like confetti and balloons. The original windows were sold at auction many years ago – but in 1988 the owners had the windows recreated. 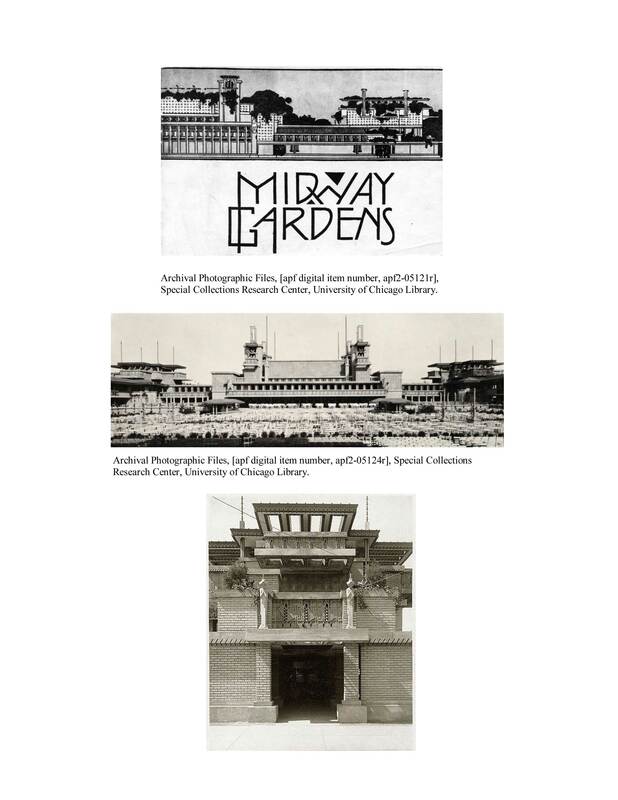 I also incorporated a frieze detail from the Midway Gardens that opened in Chicago June 27, 1914 and was sadly demolished on October 10, 1929. I loved the angled geometric designs used thought-out the structure. 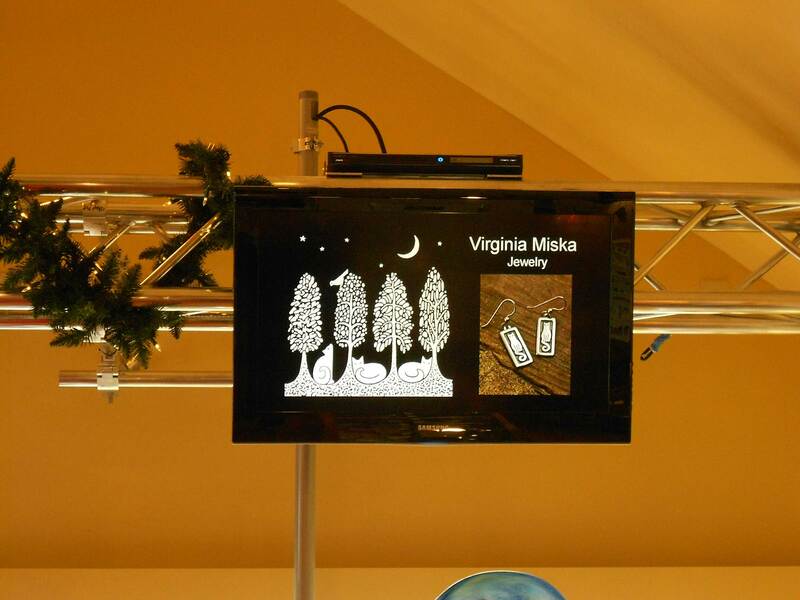 And those Garden Sprites – love them Sprites. 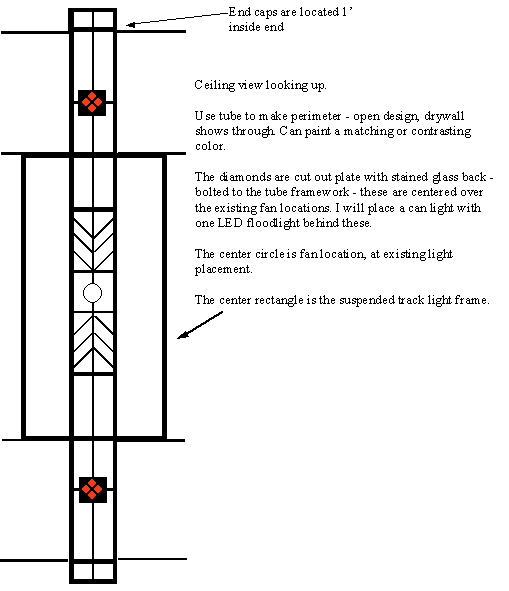 Here is my original concept to the iron fabricators. 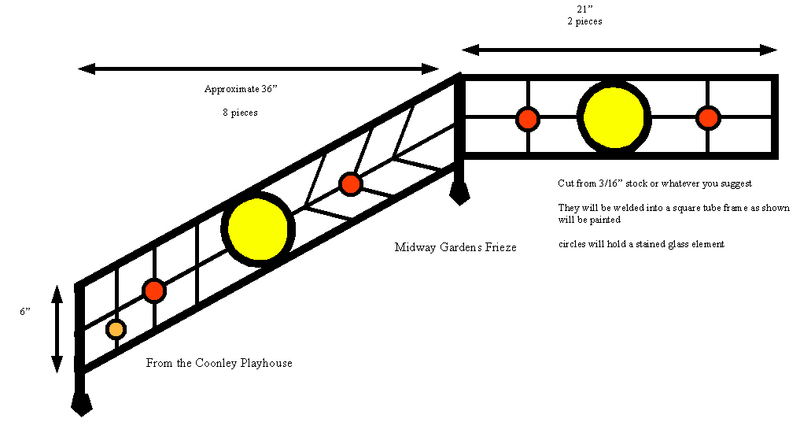 I wanted the circular elements to have some of the same design passages that the Coonley House offered, and I used the angle design elements from the Midway Gardens. My original design has small stained glass roundels added. The completed arm for the ceiling supports. The angled arms follow the slope of the gallery ceiling. These arms span nearly 12′. This is the side view of the installation. 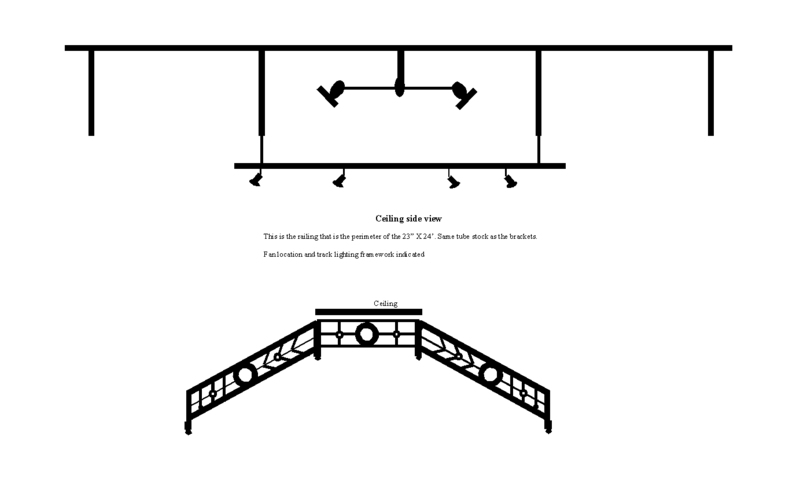 There are four of the arms attached to the ceiling with the two central arms acting as an attachment point for the light carriage below. 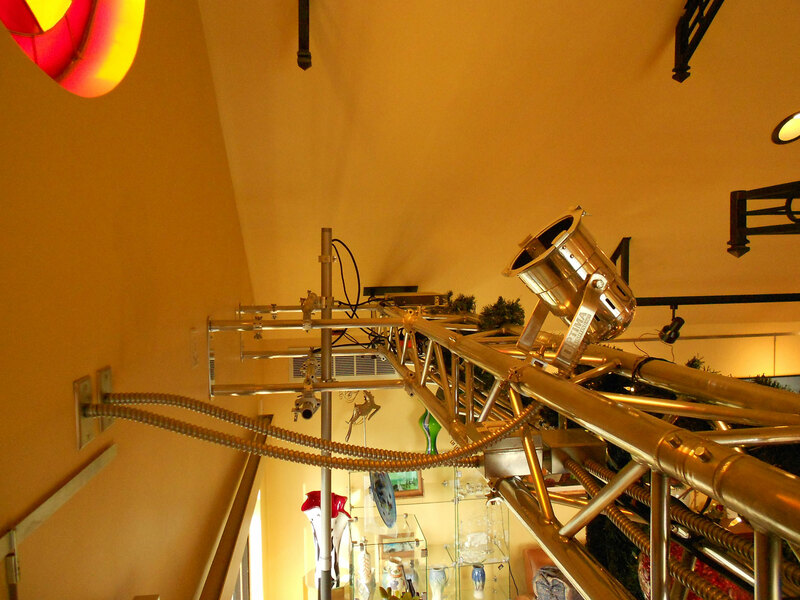 Looking up – this is the design that spans the length of the room. The scale is a little deceiving, as this element is 24′ long. 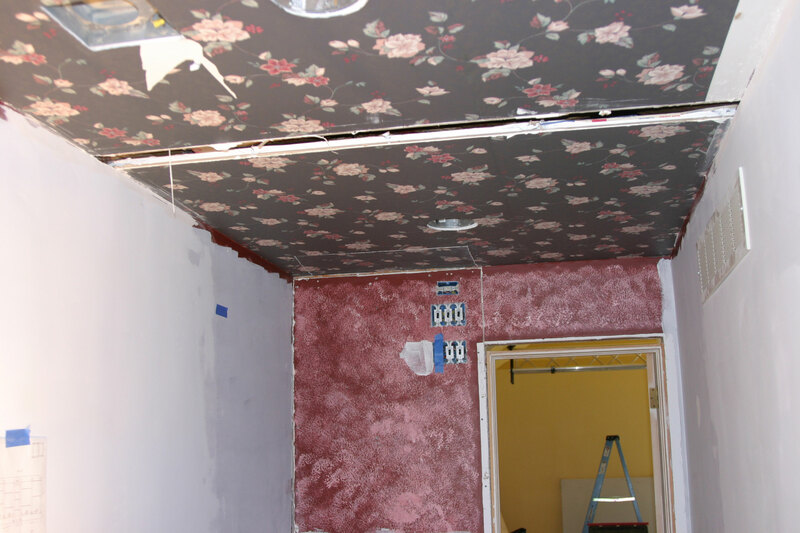 The center long thin rectangle was to cover the ceiling joints to hide the irregular seam. I added two recessed lights for the red elements that are lit with LEDs. The original ceiling light location was converted to a fan. I know the iron fabricators thought I was crazy – but a job is a job. I have no fancy drafting tools, so all was done in an old version of MS Publisher, a tape measure and ambition. I suppose we’re off on an interesting journey. We’ll see how it works out – stay tuned.